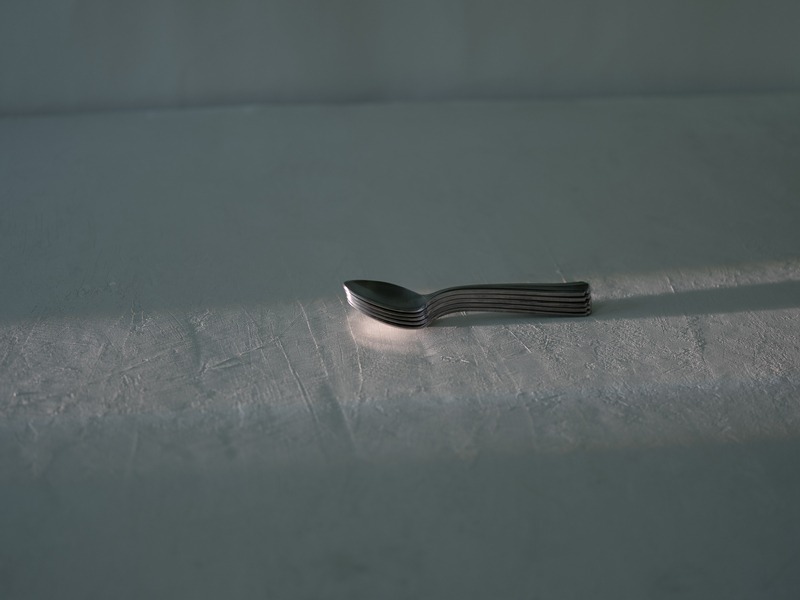 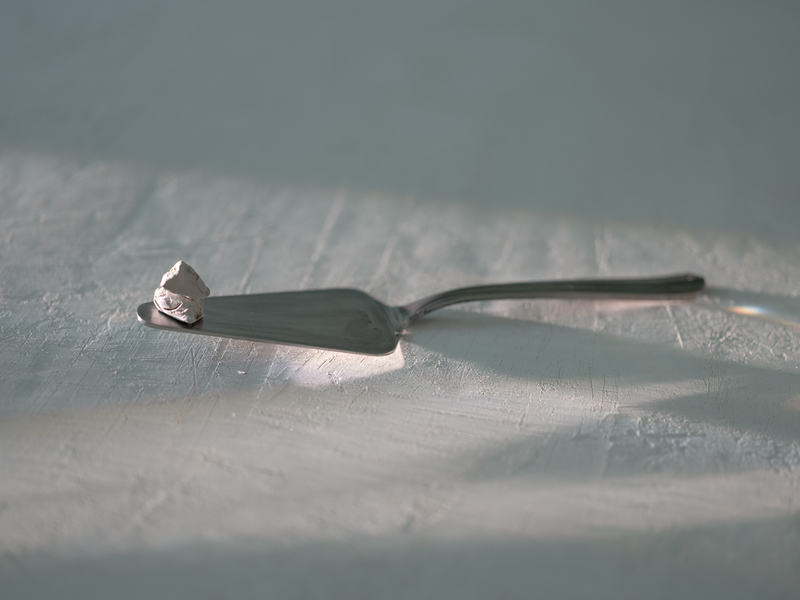 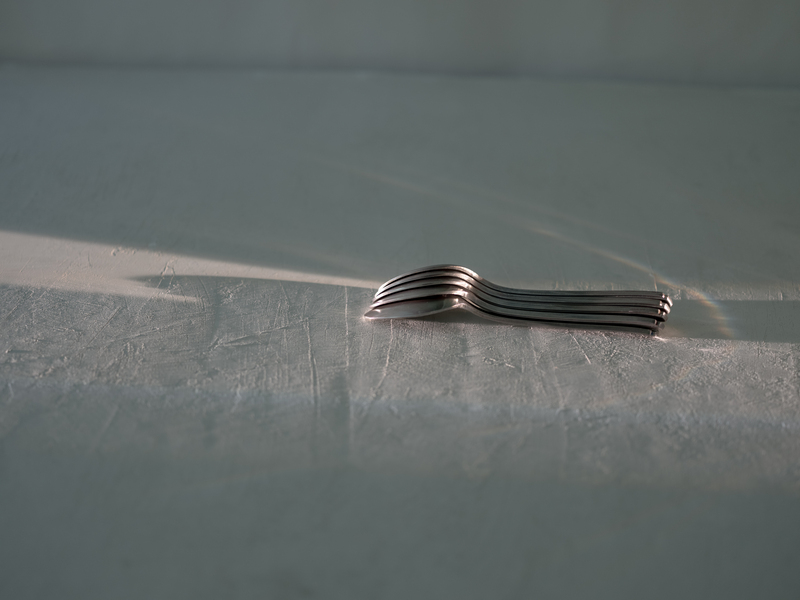 If steel and spoon, yet unformed, were both asked, "what shape shall you take?" 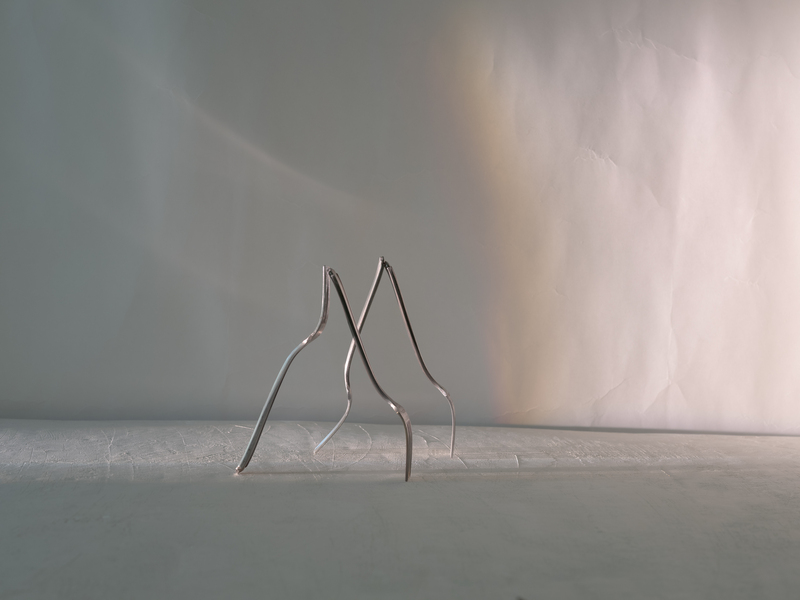 they'd morph into the 'ryo' series and ready for their finish by metalware artist Yuichi Takemata, confident in their curves, their weight, their finish, their feel, their use. 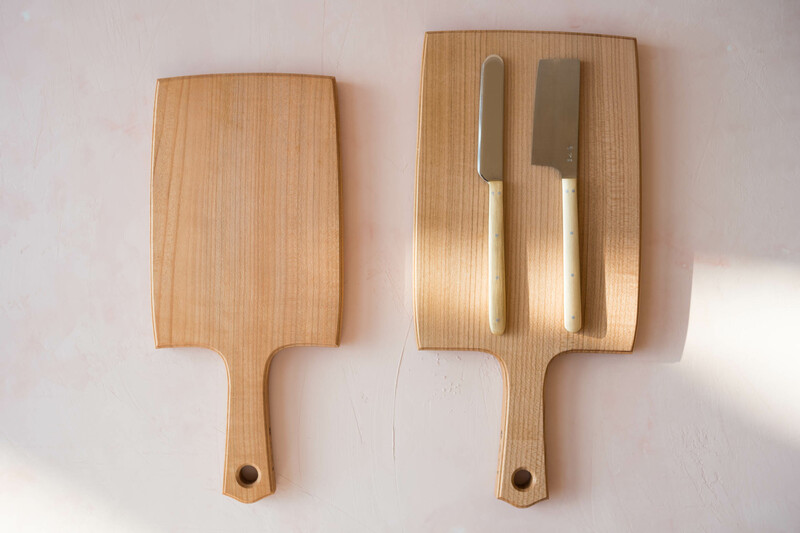 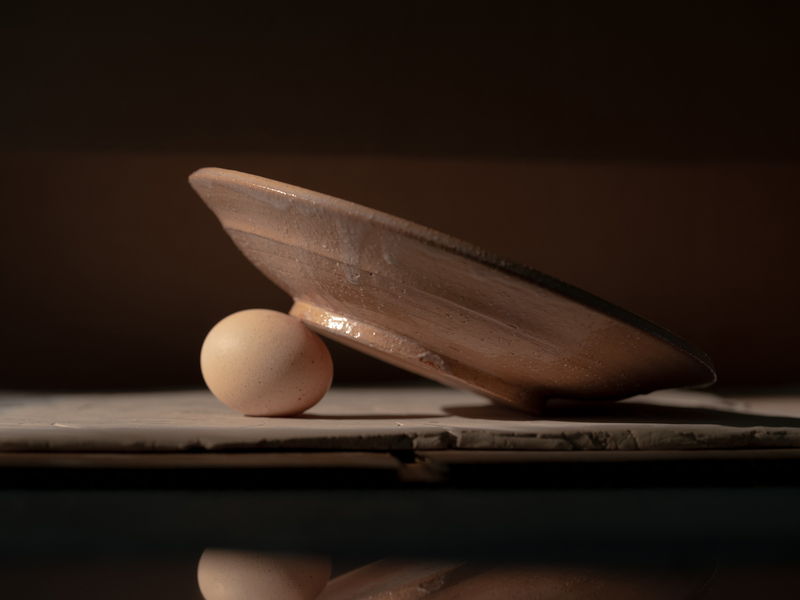 It's as if Osamu Saruyama in his designs has drawn out the essence of what it means to be each of these tools, not just for maximum pleasure, but out of deep understanding of the necessity of food and a duty to create awareness of each step in the ritual of sustenance. 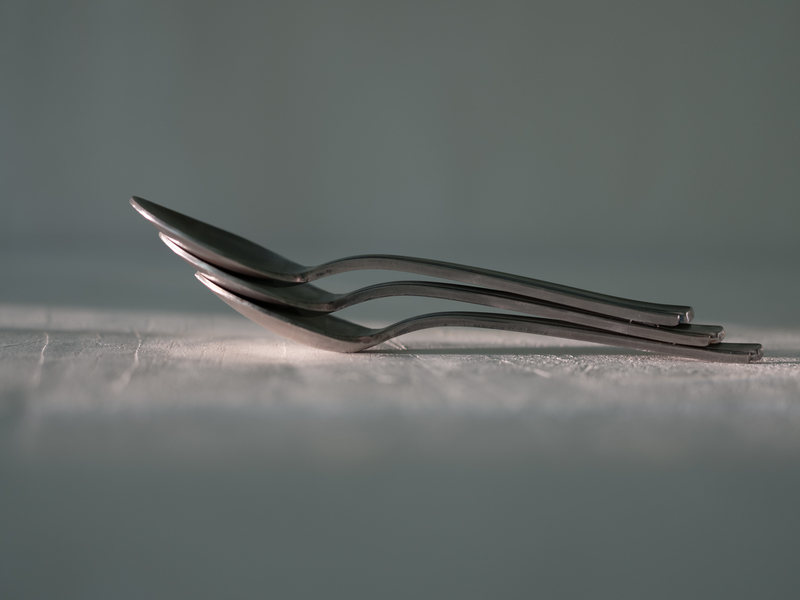 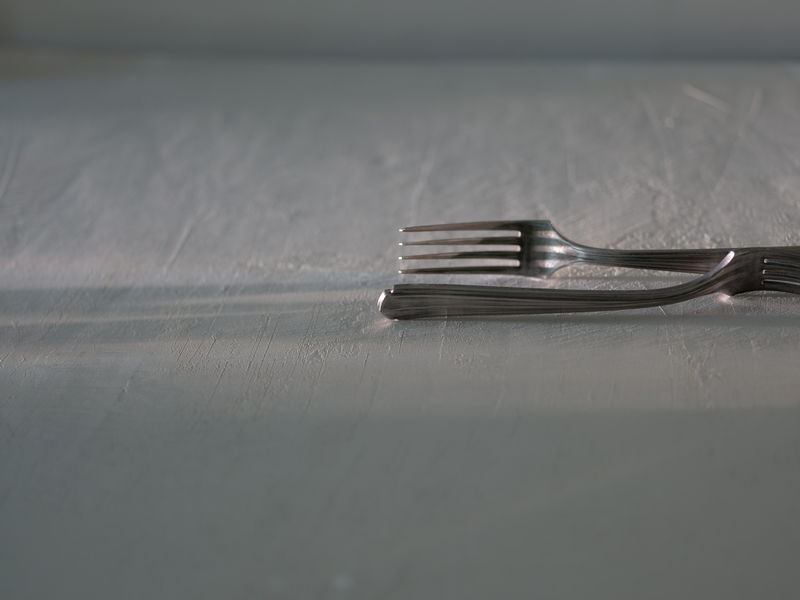 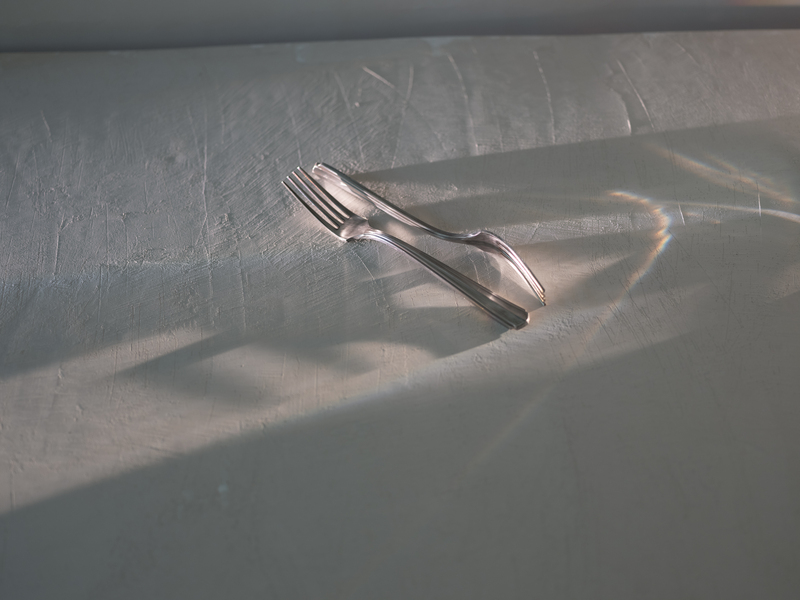 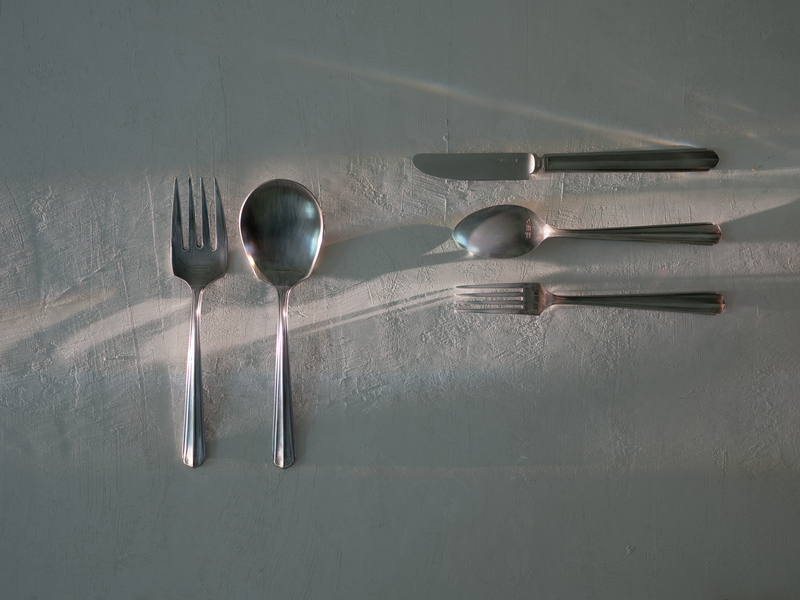 When using these utensils, each moment from picking up the utensil, to contact with the food, drawing it towards the mouth, and the feel on the tongue and the lips is animated, elongated. 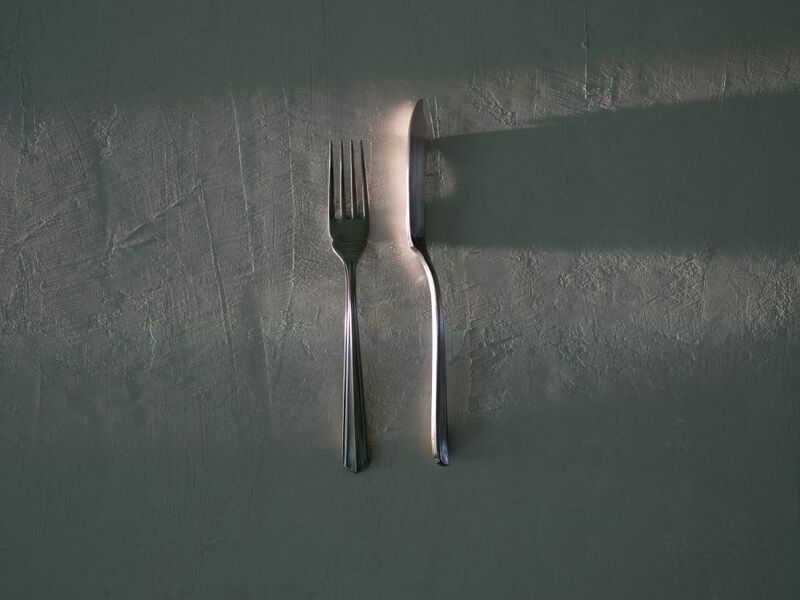 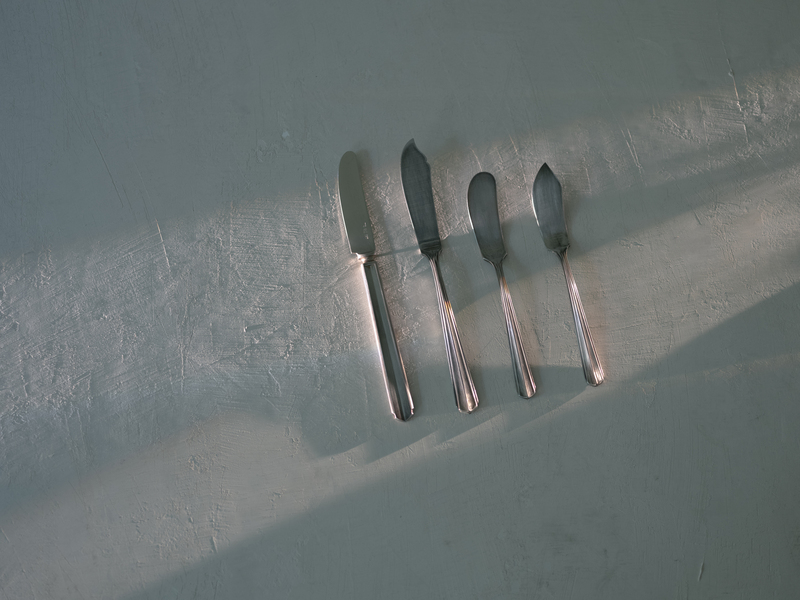 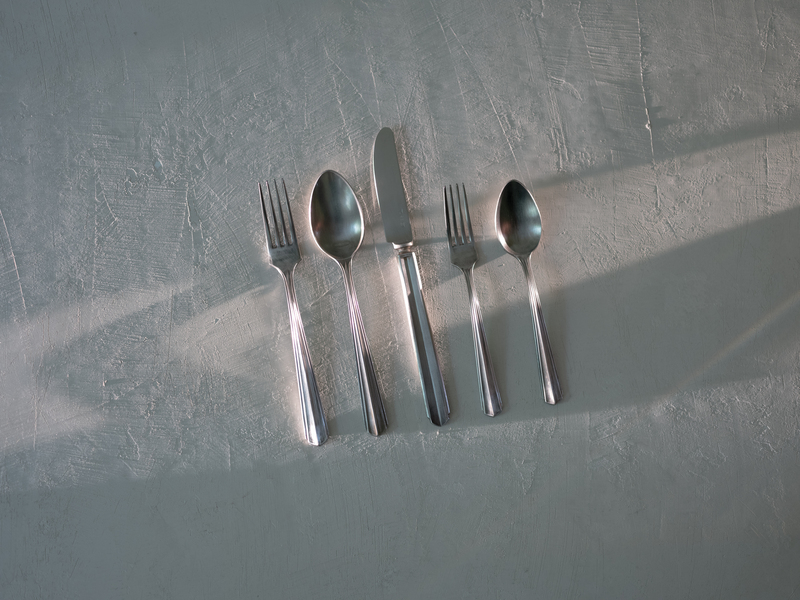 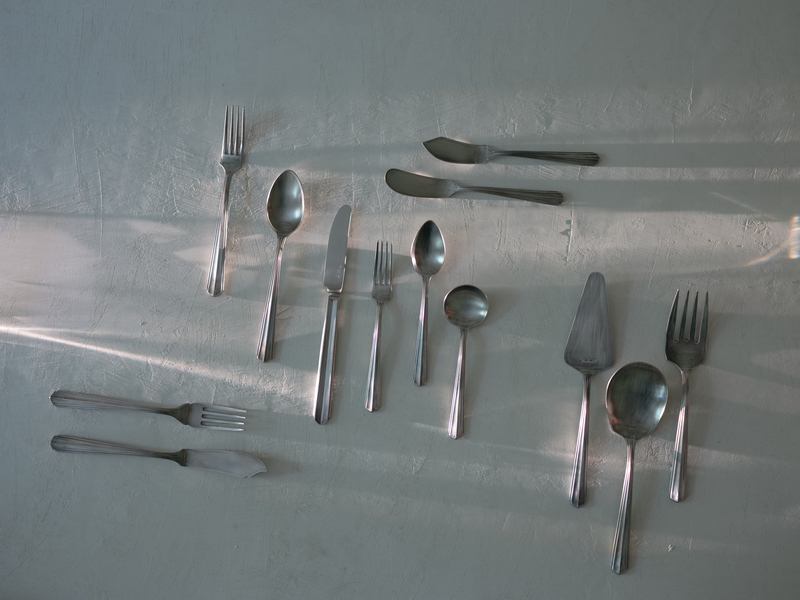 Pressed stainless steel by Tasan Kinzoku Co.
Care: Patina may change over time. 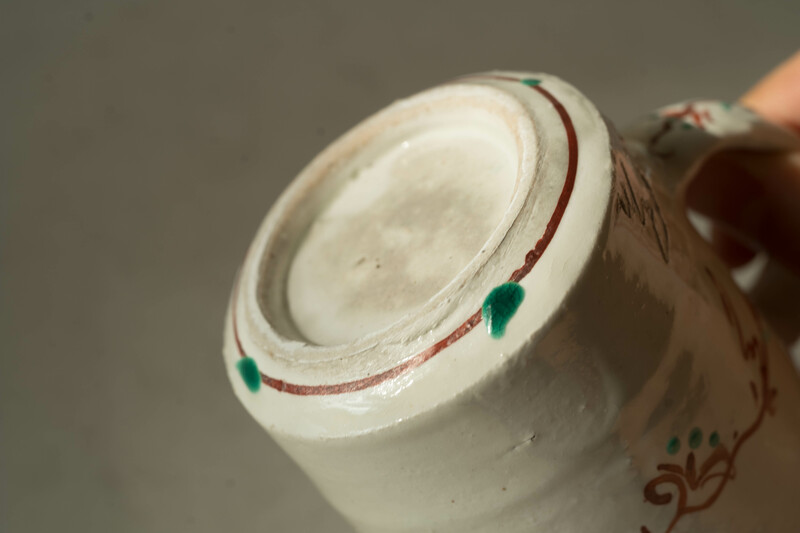 Avoid abrasive cleansers and brushes to preserve antique feel. 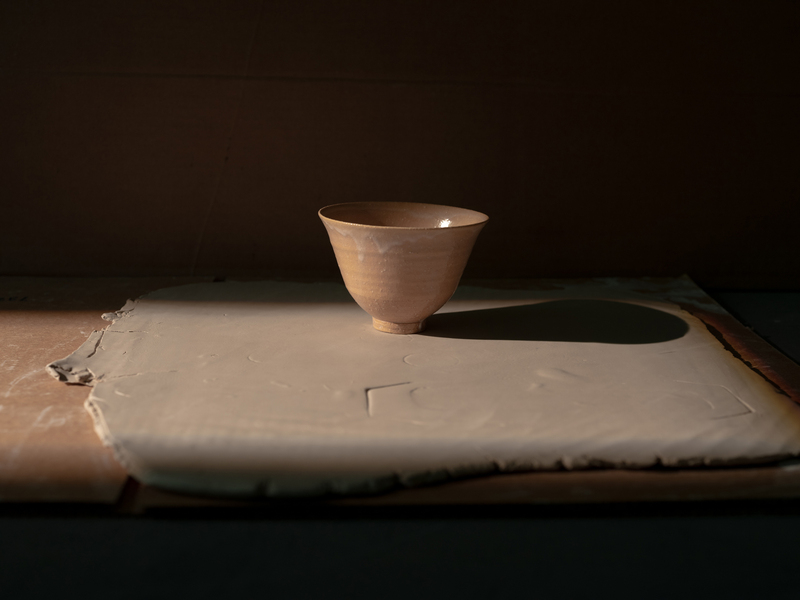 Three dishes whose clay bodies were fractured during their journey from Hagi to New York were mended using lacquer and gold powder in the method known as "kintsugi." 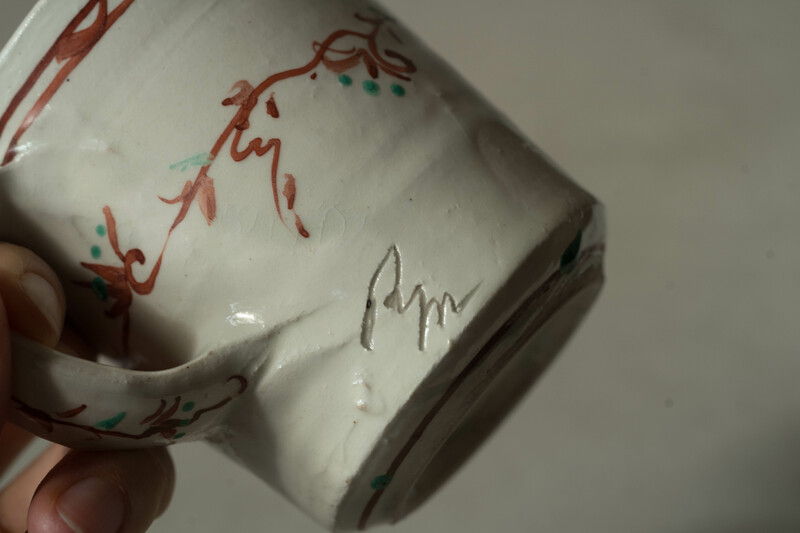 Their cracks and subsequent repairs reveal each one's individual spirit, a wonderful start to their growth as objects of meaning and use. 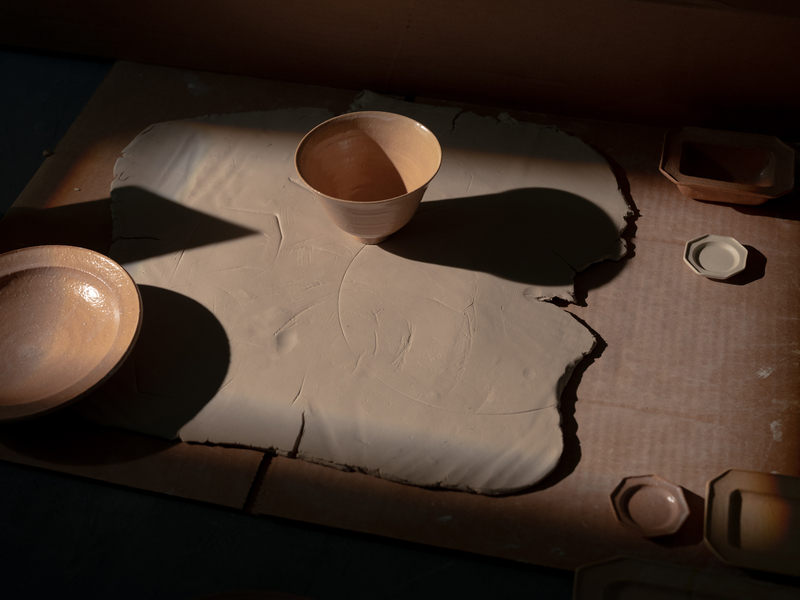 The human body is implied in the blush toned clay of Hagi. 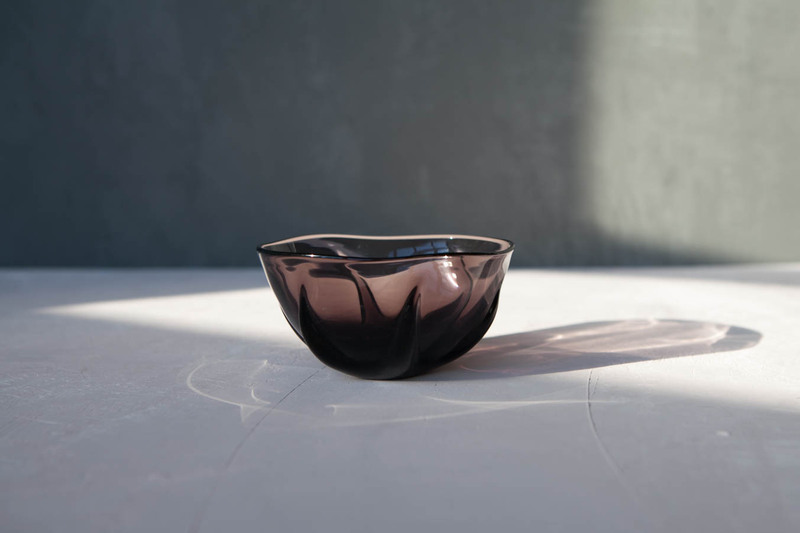 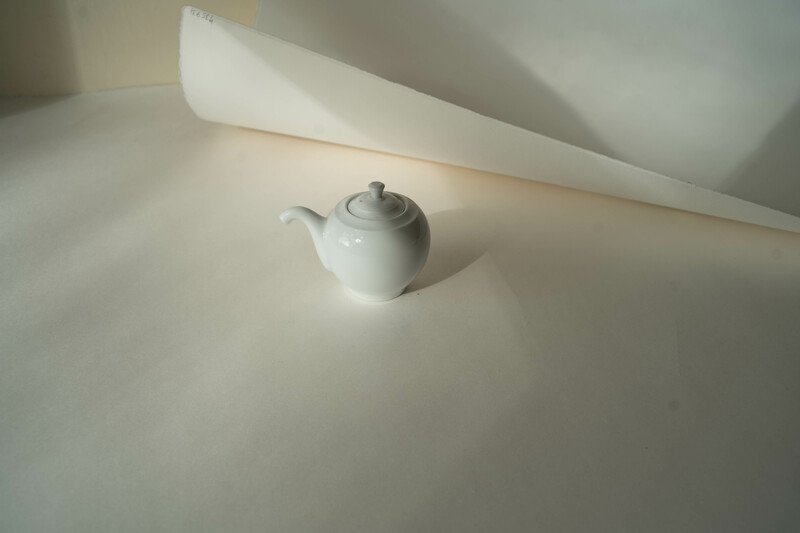 Osama Saruyama brings more awareness to this connection in the elegant curves of this feminine bowl, rising to unusual height in a graceful bellow from its petite foot. 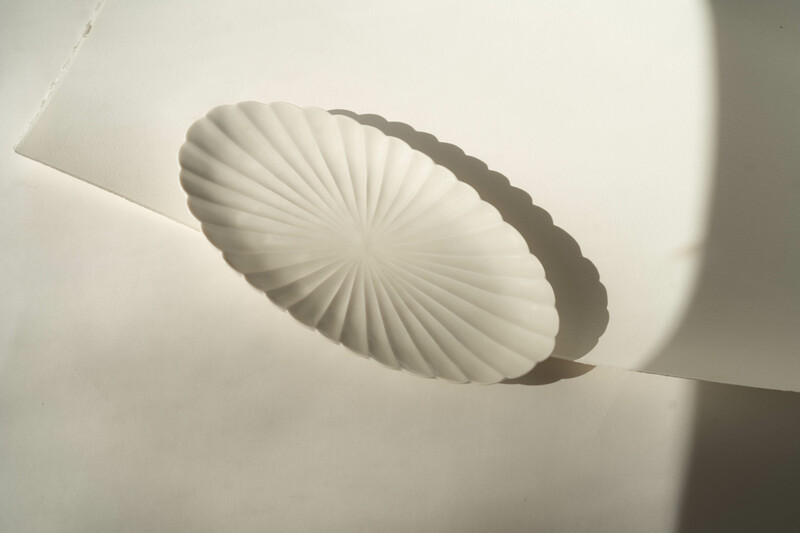 DEEP DIAMOND SIDE DISH "MUKOU"
Designer Osamu Saruyama plays so ingeniously with roundness and precision in his designs that always seem to carry in them a level of familiarity and timelessness perfectly balanced with modernity. 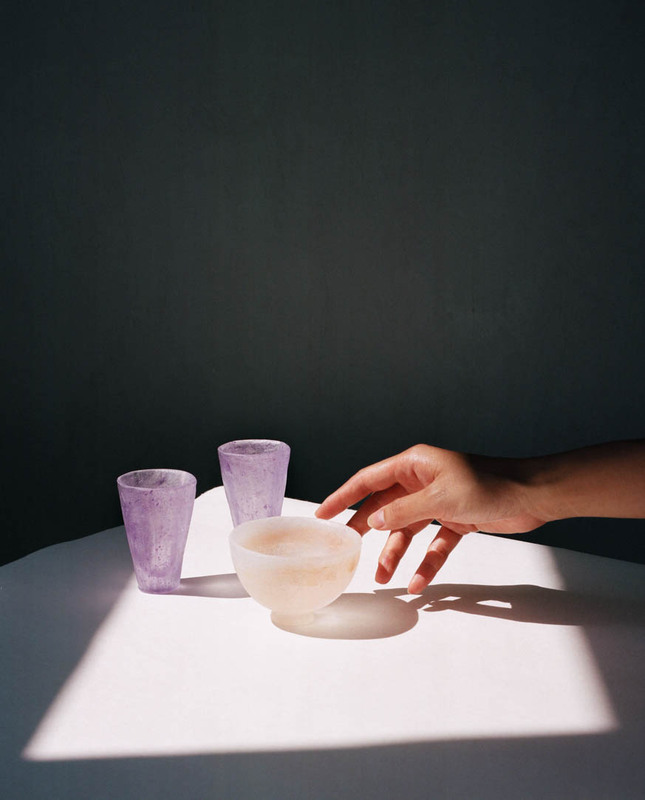 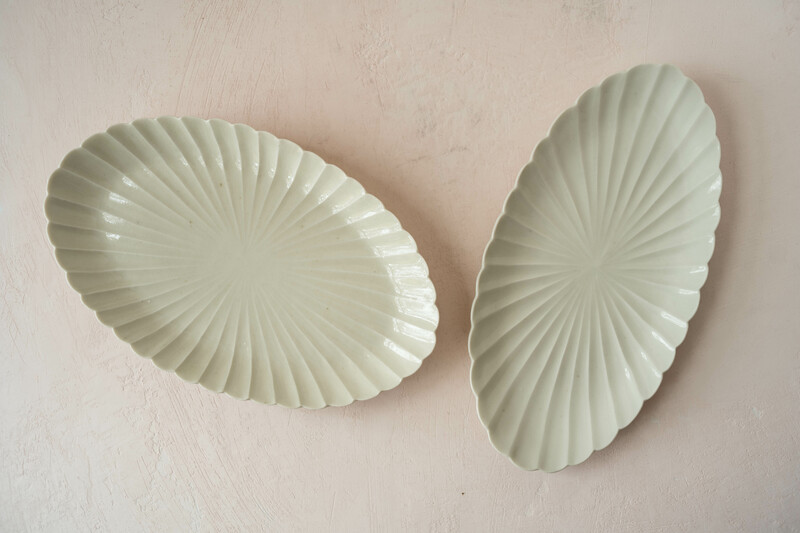 A defined edge on the rim of these round bottomed dishes, made of earthy blush-toned Hagi soil with a translucent white glaze, gives delicacy to a material with roughness and depth. 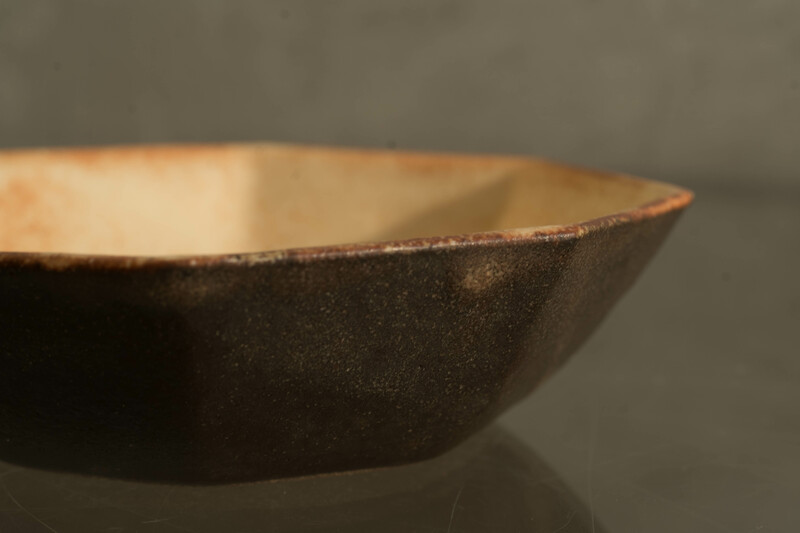 Hagi ware, venerated by tea masters for ceremonial use, matures with use, taking on several tones throughout its life. 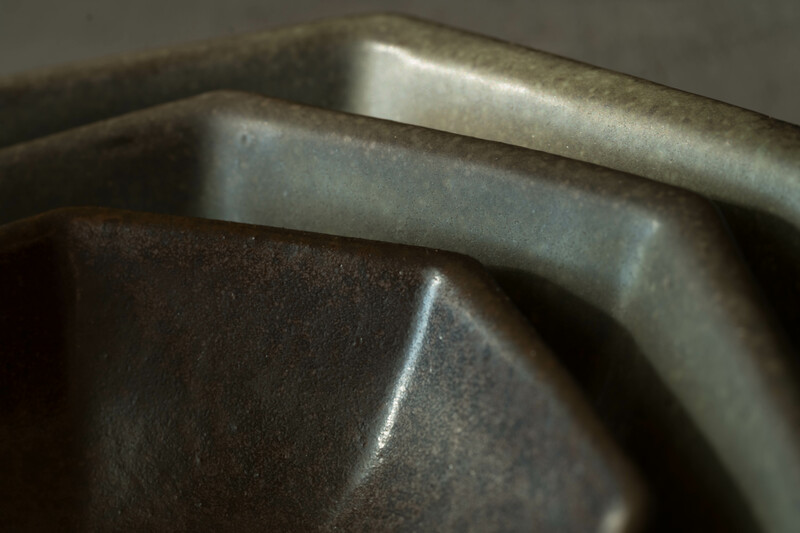 DEEP RECTANGULAR SIDE DISH "MUKOU"
Standing high on its tall foot, this plate edges upward with a low and pleasant curve. 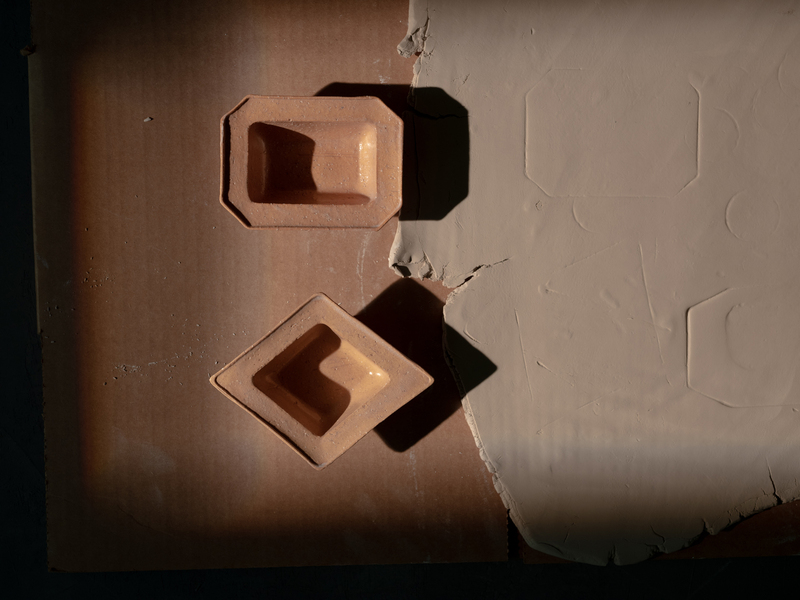 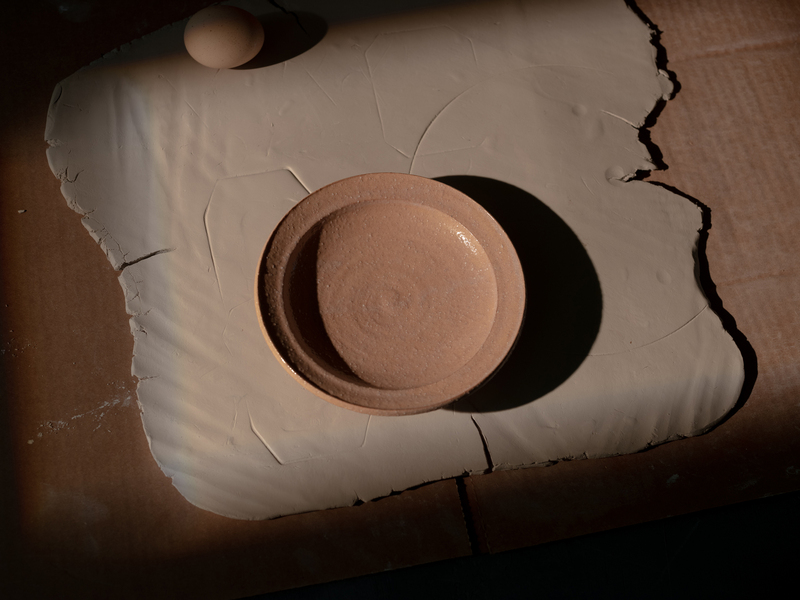 A creamy white glaze of subtle translucency softens the blushing reddish clay base made of soil from Hagi. 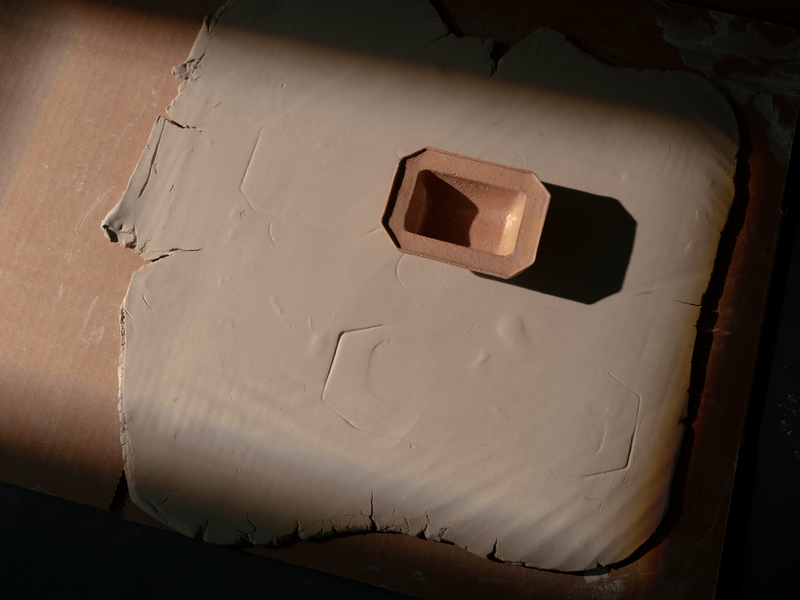 Impressions of time will become embedded in its earthy, slightly porous clay and fine crazing of the glaze. 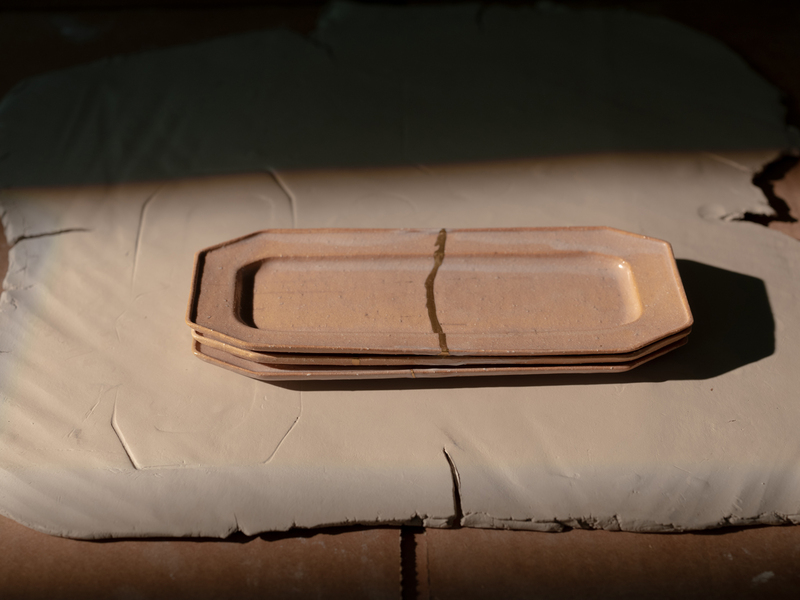 Because of its changing tone and maturity over time, Hagi ware has the capacity to hold tremendous spirit. 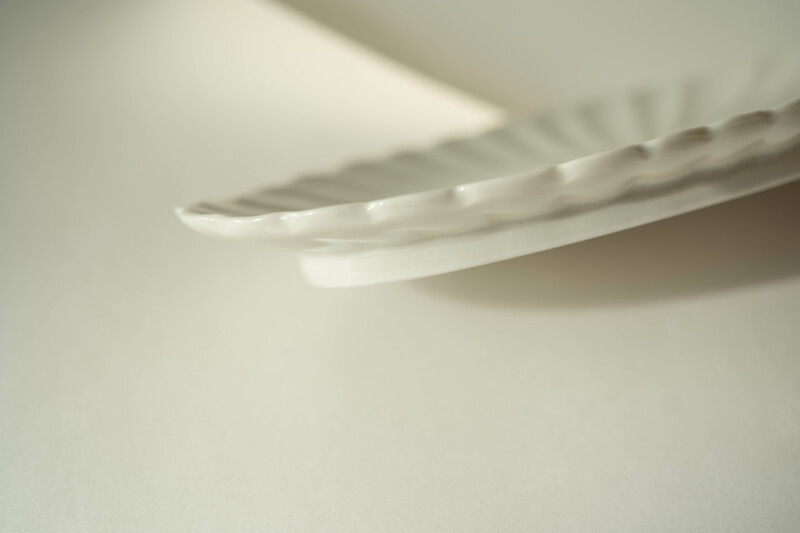 Standing high on its tall foot, this medium sized dish edges upward with a low and pleasant curve. 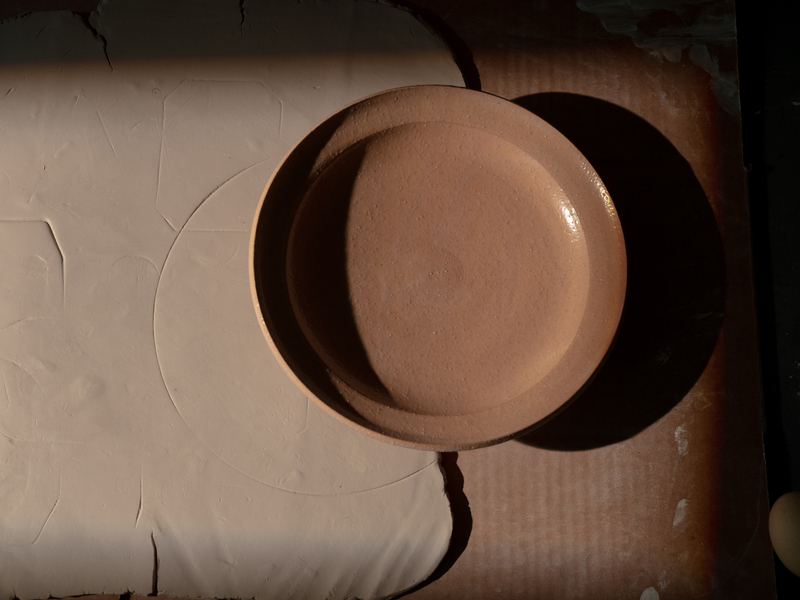 A creamy white glaze of subtle translucency softens the blushing reddish clay base made of soil from Hagi. 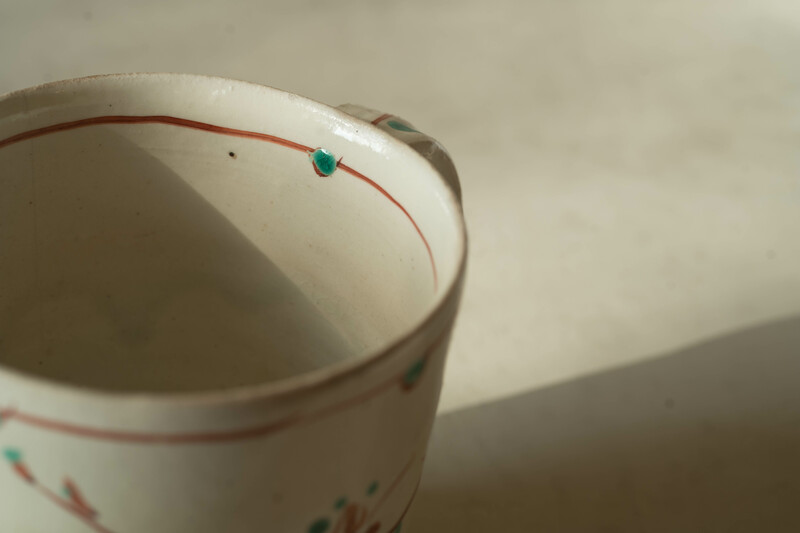 Impressions of time will become embedded in its earthy, slightly porous clay and fine crazing of the glaze. 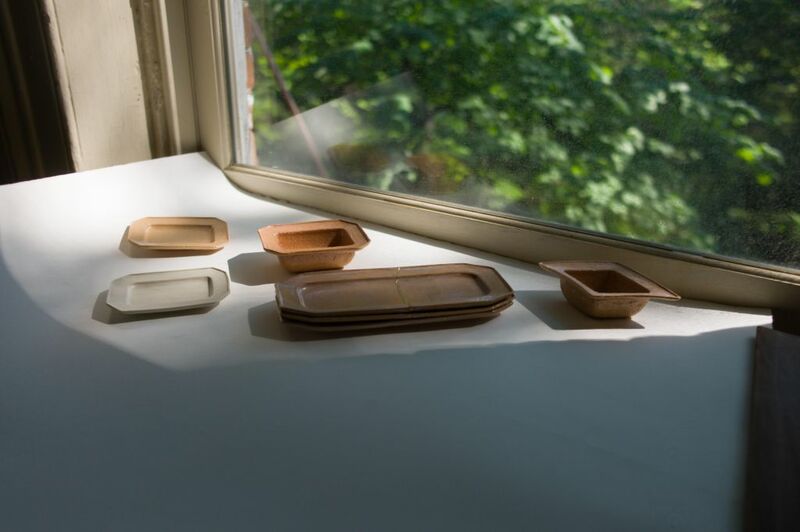 Because of its changing tone and maturity over time, Hagi ware has the capacity to hold tremendous spirit. 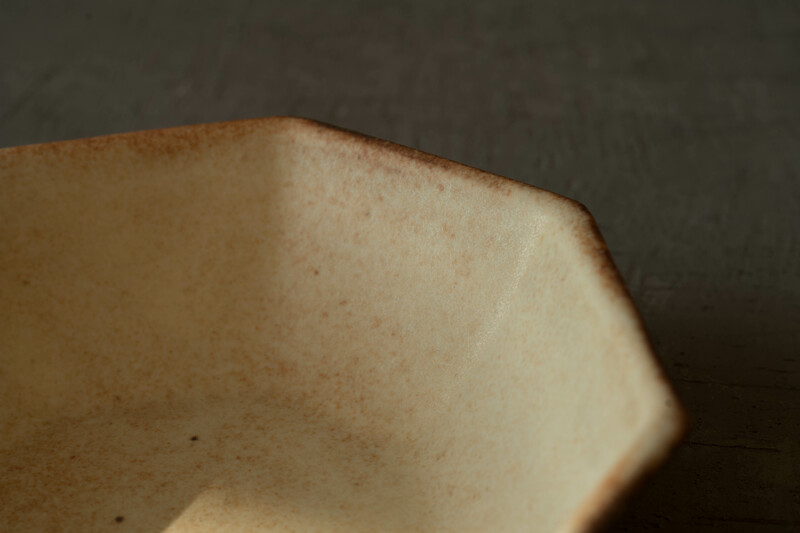 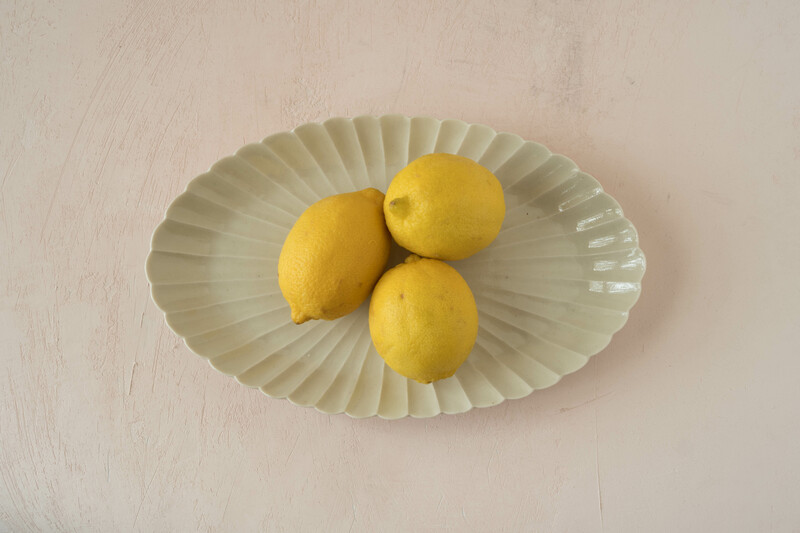 The handsome simplicity of this octagonal dish belies the obsessive nature of its maker, Yoshiyuki Ito, who spent eight years developing the glaze formulas for his current works. 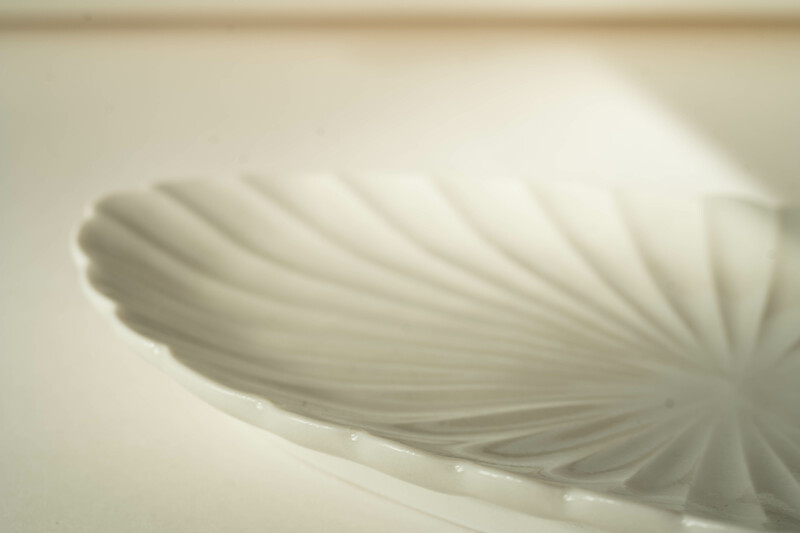 Ito found his path into ceramics initially through a deep interest in the art of kiln and oven design. 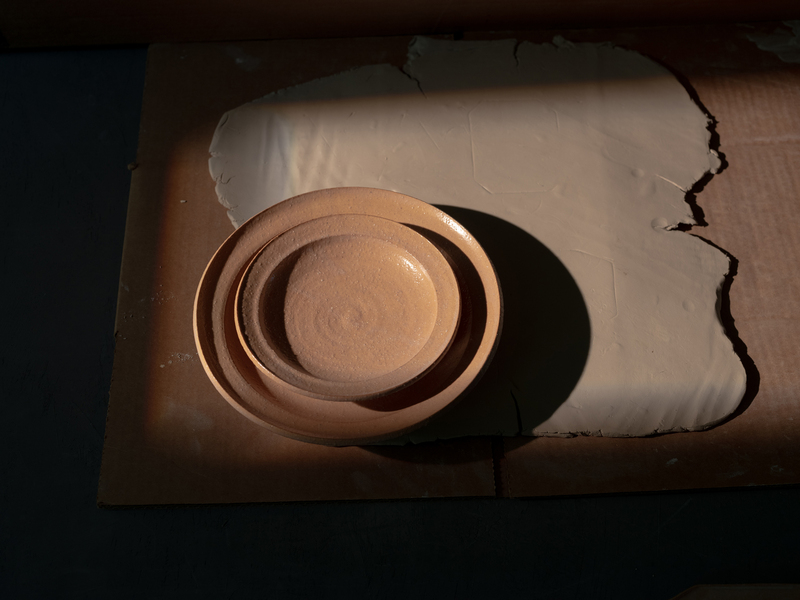 In his desire to know all he could about the subtleties of these heat producing cauldrons, he moved to Oregon in his twenties to apprentice with an expert in kiln design. 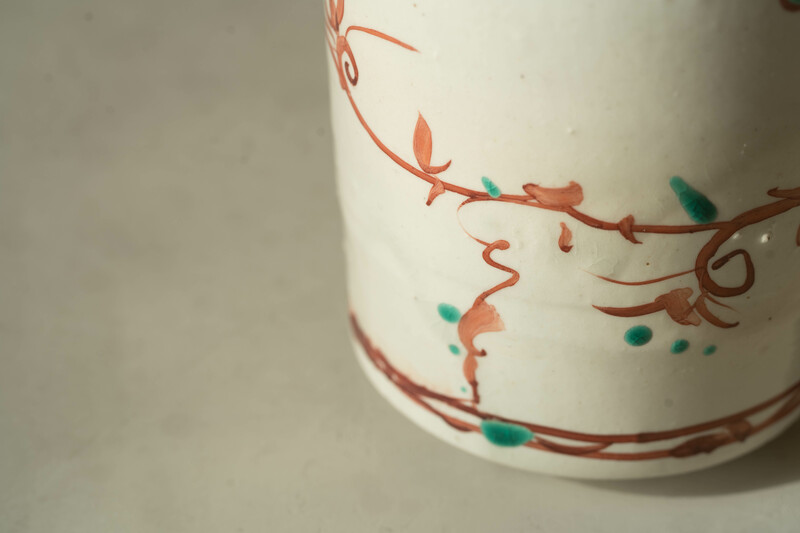 Furthering his studies with another Japanese kiln-master led him to his current home of Mashiko, in Eastern Japan. 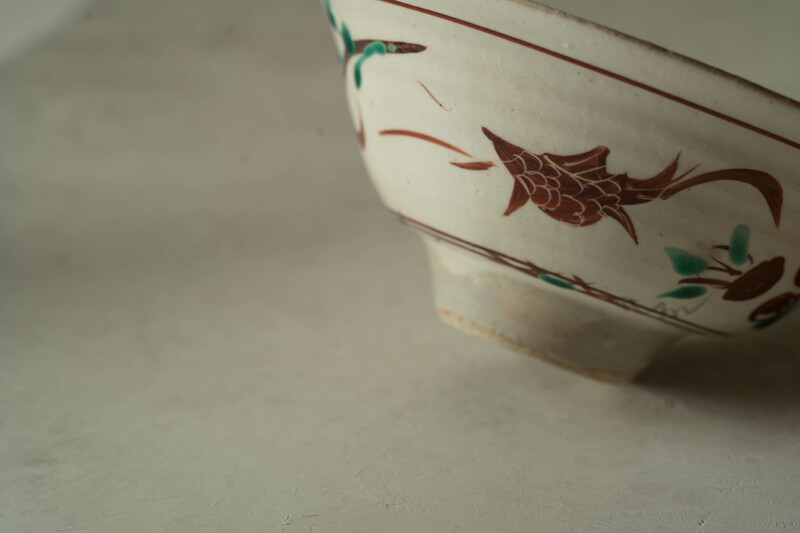 Mashiko, with its long tradition of ceramic arts and its hundreds of kilns hidden among its green hills, was a natural landing place for a man of Ito’s specific knowledge. 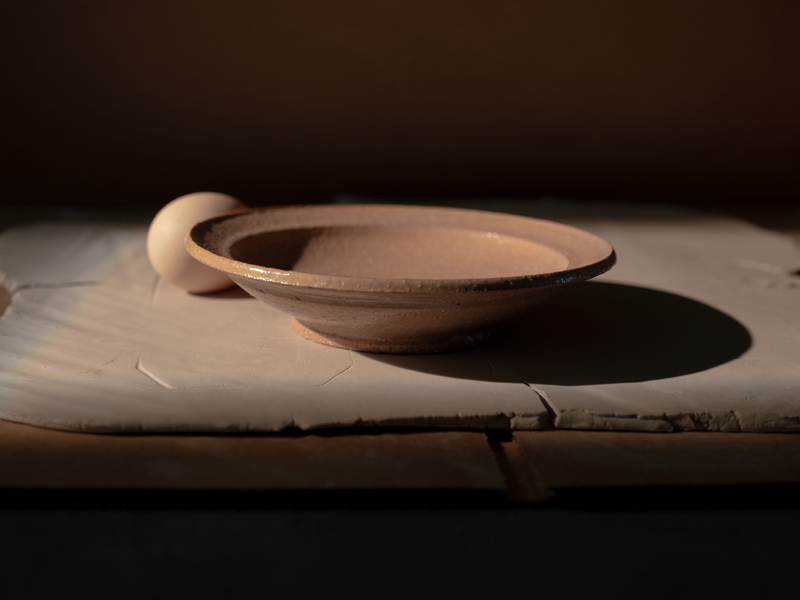 Here, Ito honed his skills building kilns for ceramic artists who would eventually become his peers in his new craft building ceramic vessels. 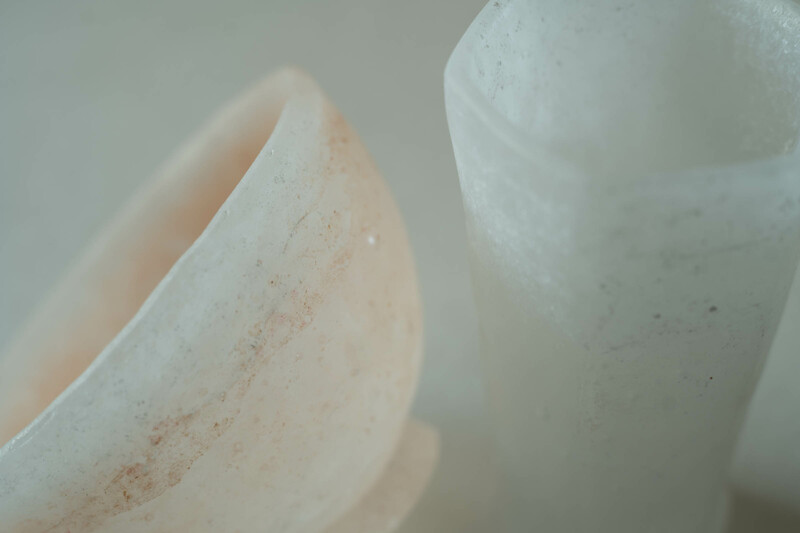 To be sure, Ito’s kiln is an impressive machine, the top of which is lined with countless stumps of clay bowing over in beautiful arcs. 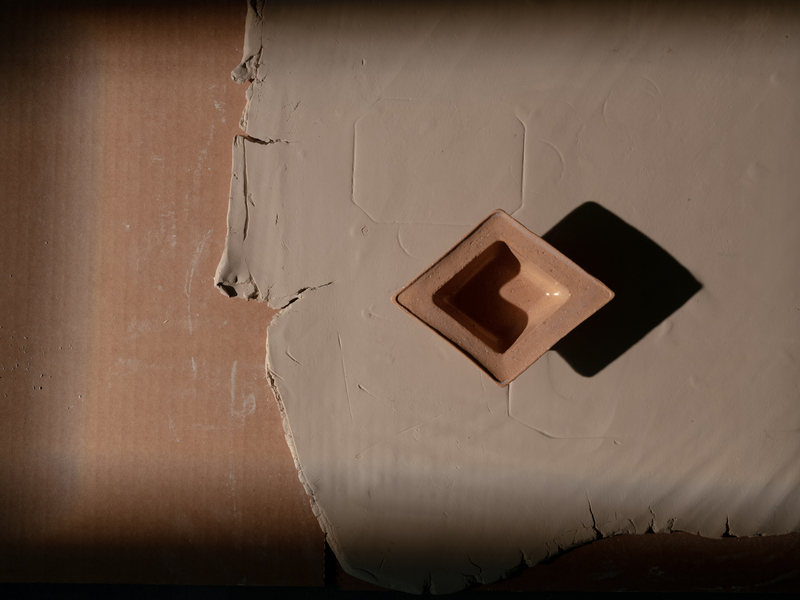 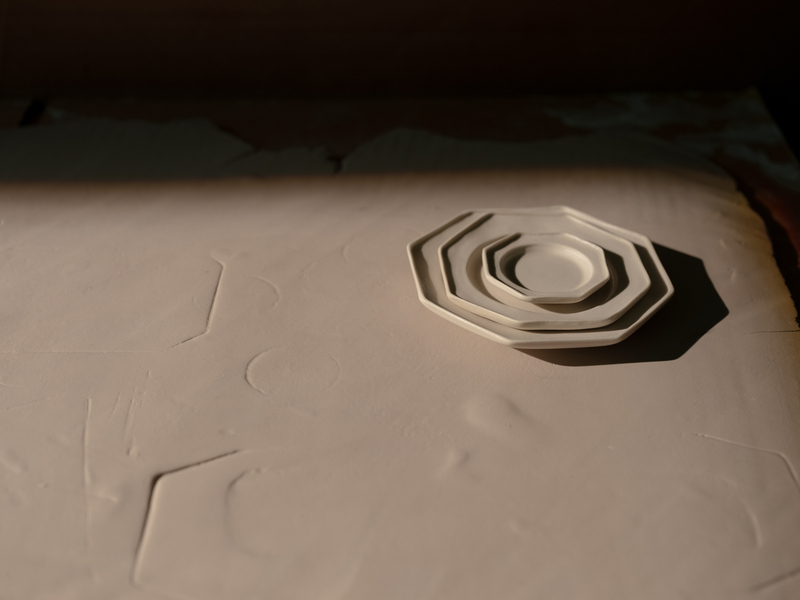 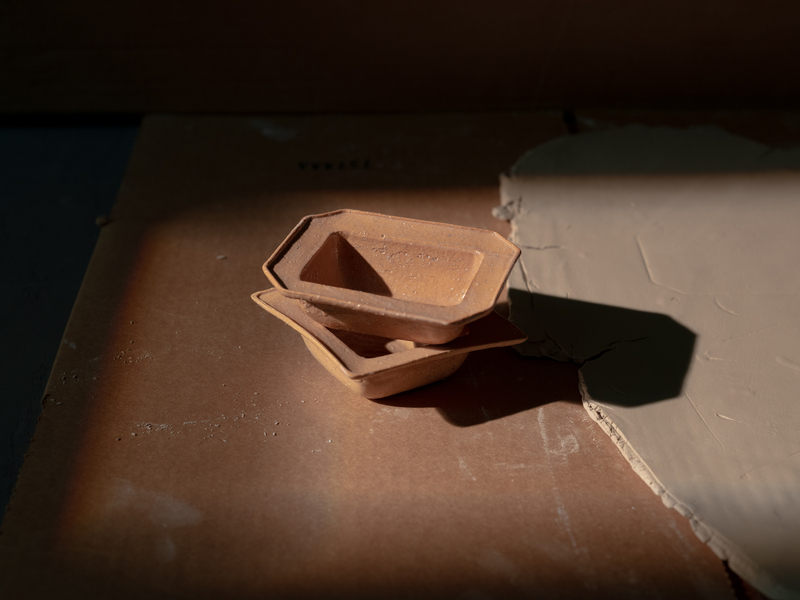 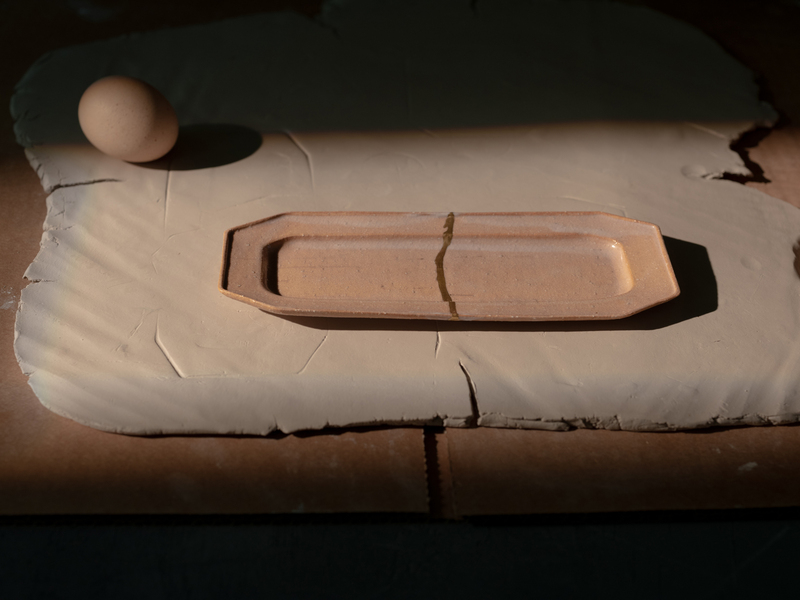 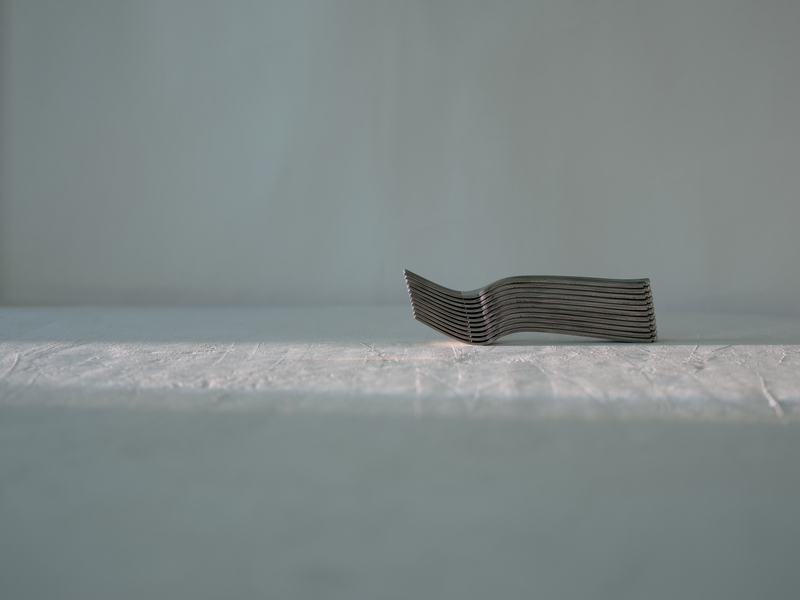 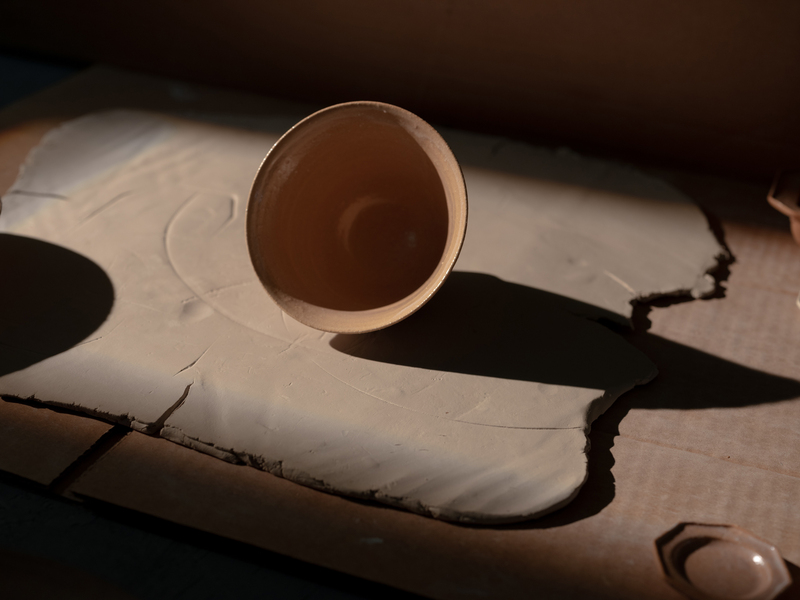 Deferential to the heat of the kiln, their specific curvatures signal to Ito the melting points of the clay material and how they are interacting with his machine, or rather, how his machine is acting on them. 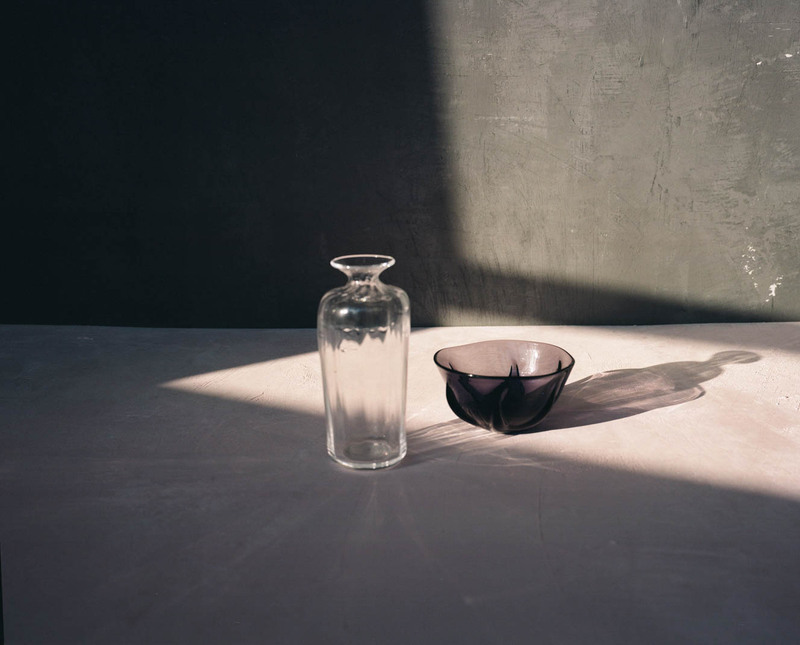 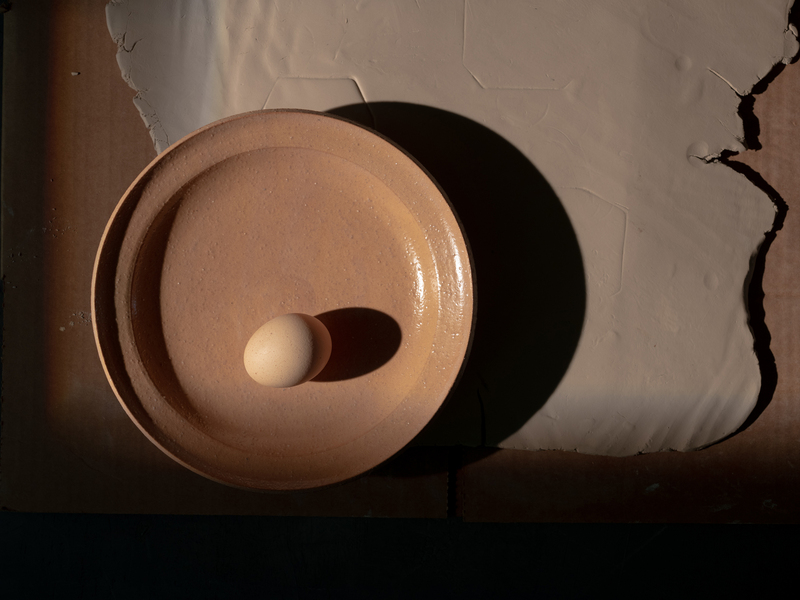 Once Ito began working with clay, the same drive towards a deep sense of knowledge and execution of ideas led him to the 8 year process of developing the semi-matte glazes for his current works. 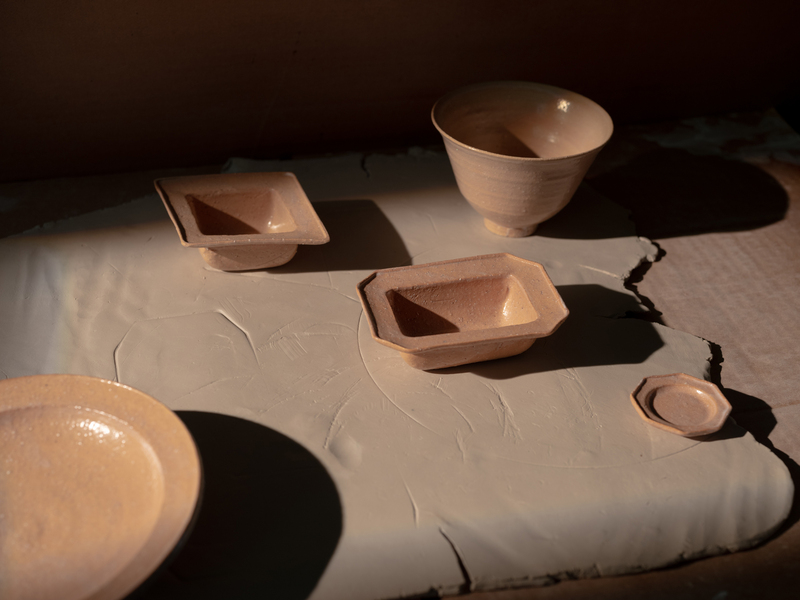 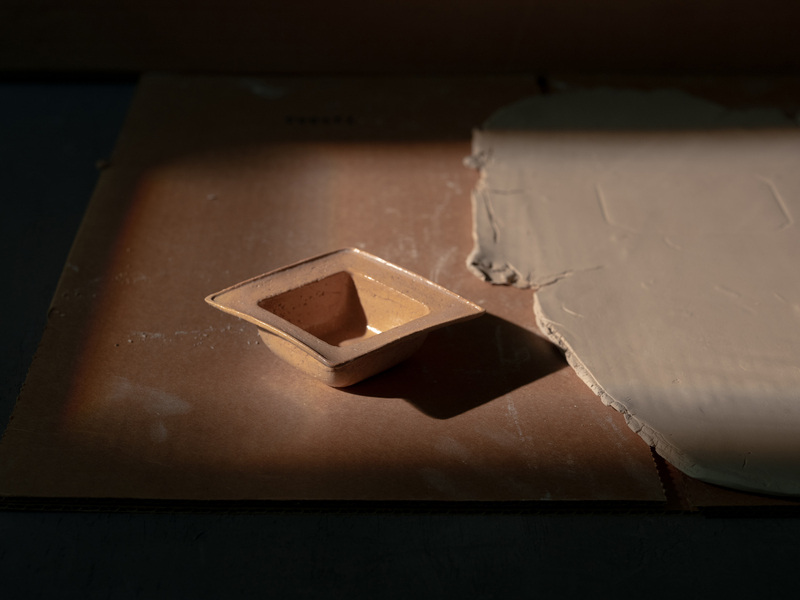 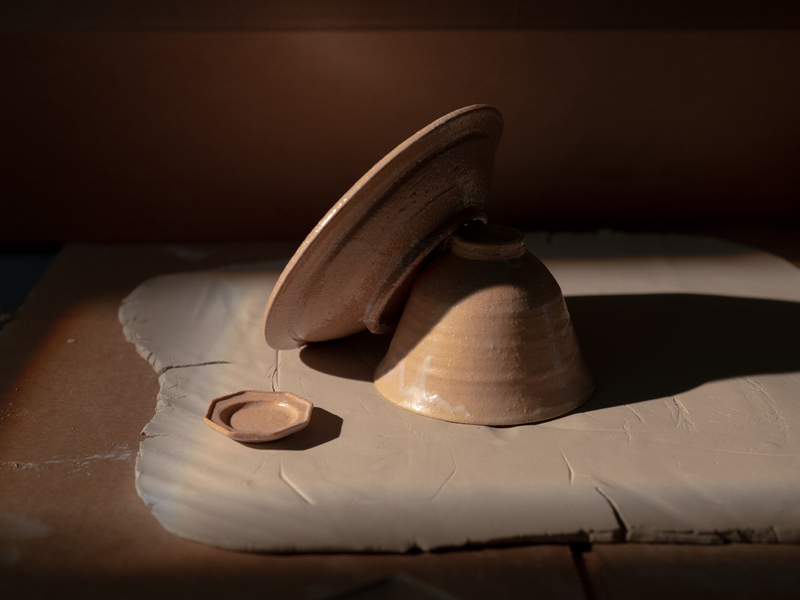 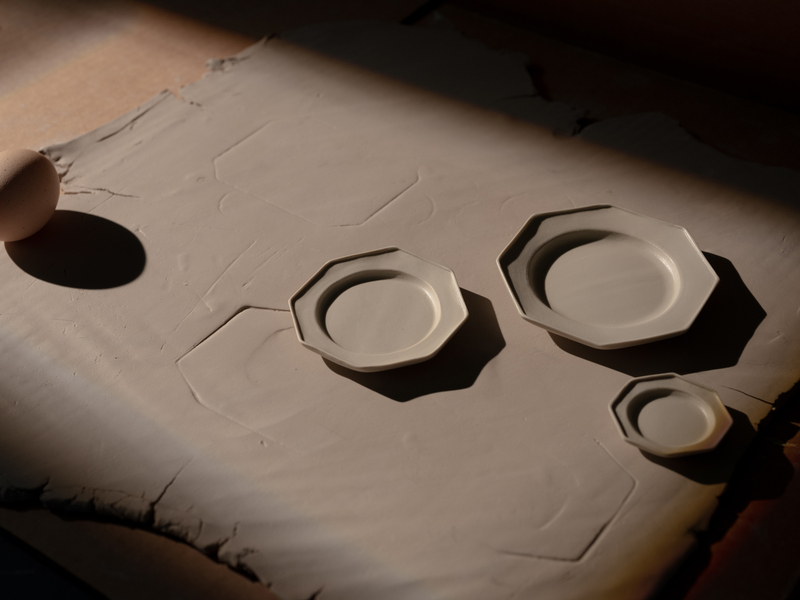 Working with local clay from Mashiko, Ito throws and alters each piece into simple functional shapes meant to bridge traditional Japanese techniques and a Western way of table-setting. 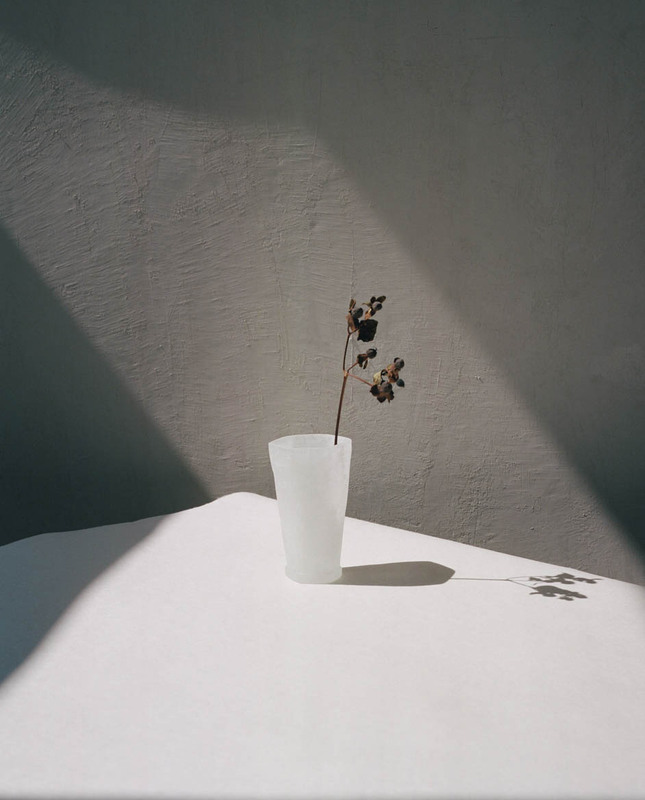 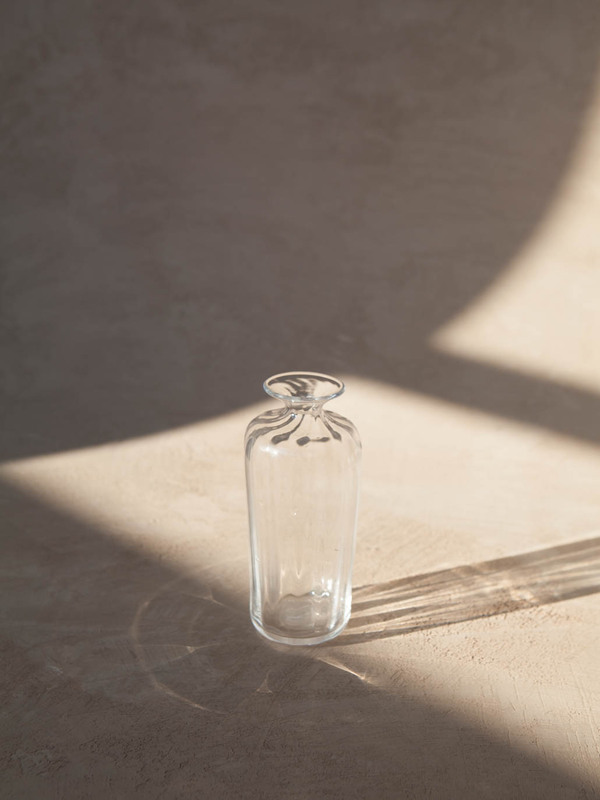 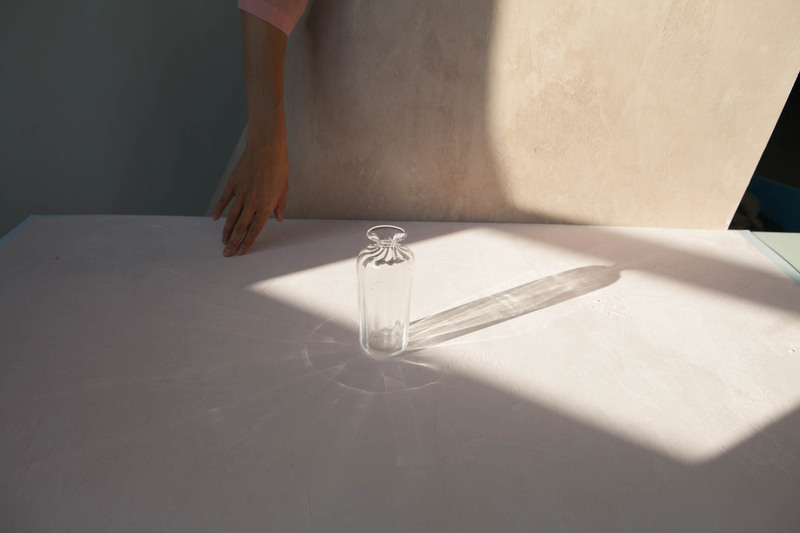 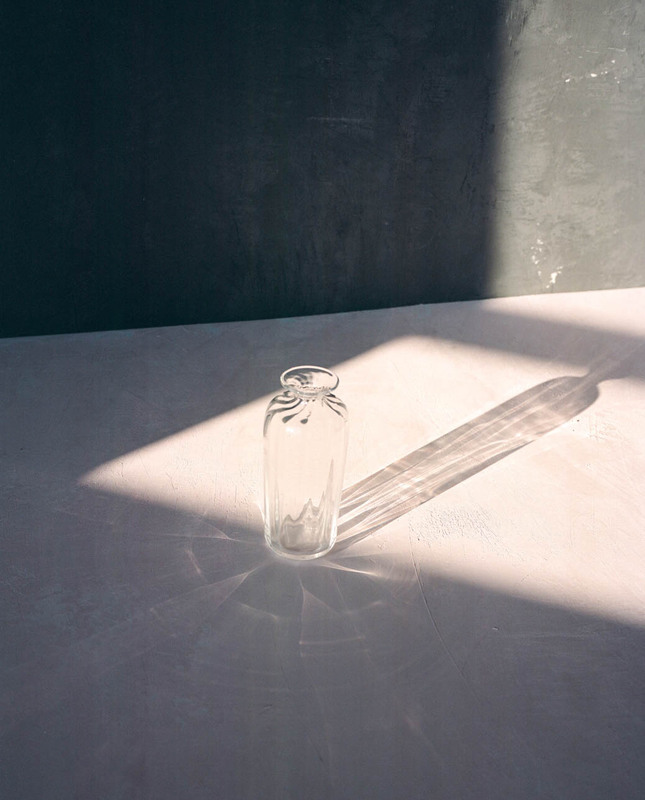 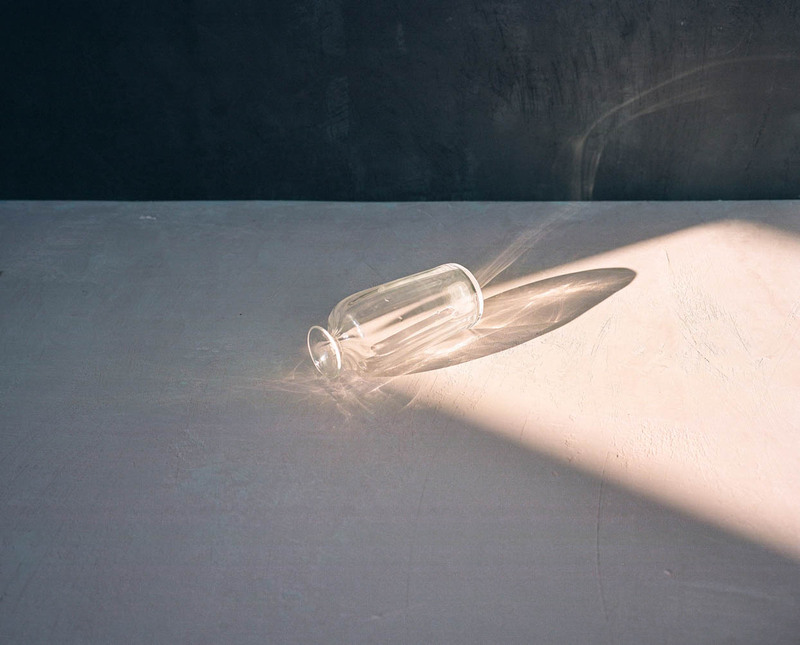 A delicate twist at the neck of this vessel illustrates Yoji Sugiyama’s talent in creating poetic glass works in even the simplest of silhouettes. 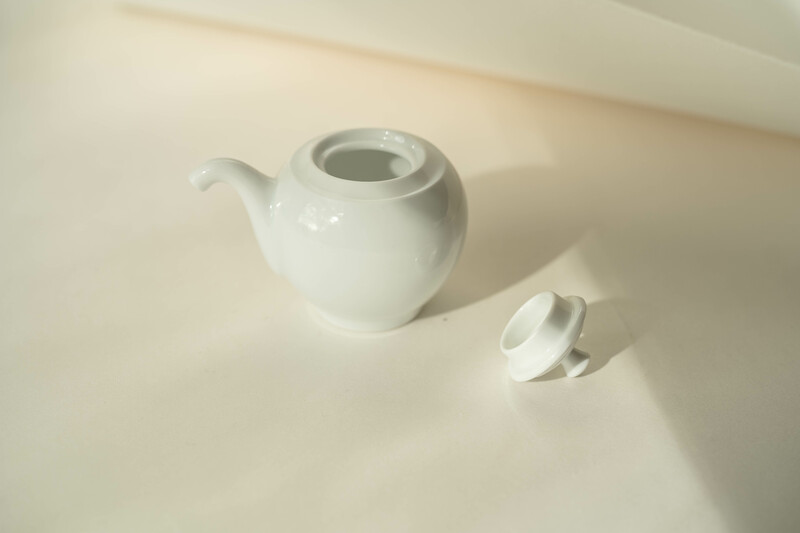 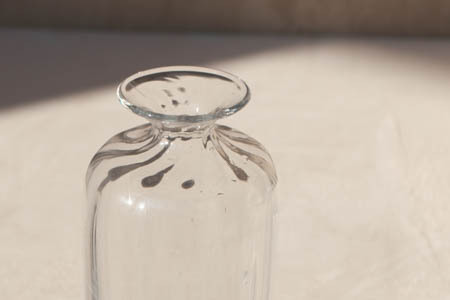 The 'tokkuri' is a classic sake decanter shape characterized by the pinched neck. 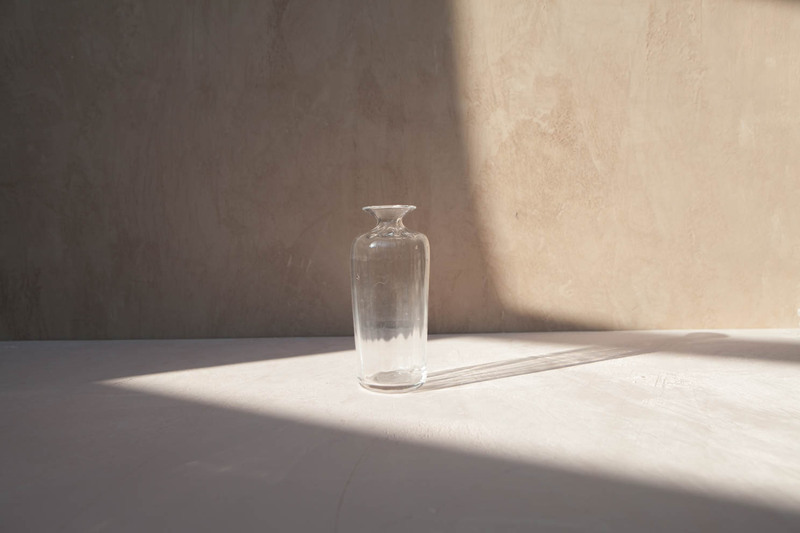 Sugiyama's rendition is equally wonderful in use as a bud vase. 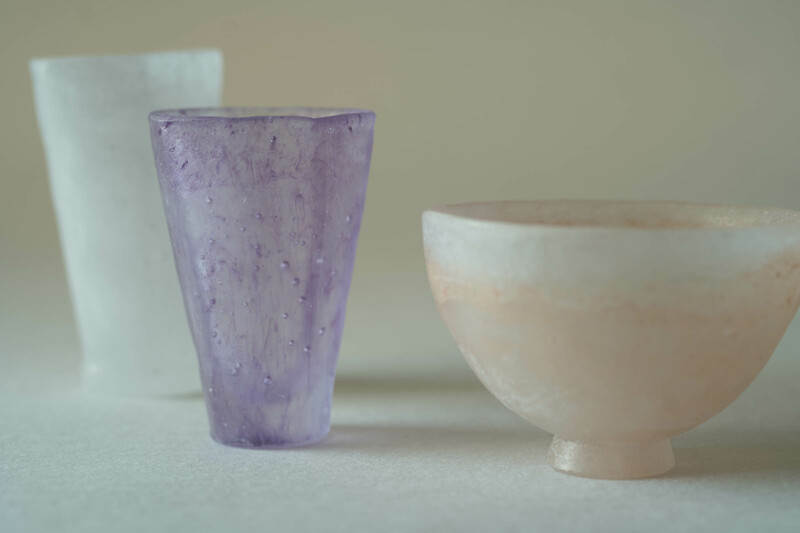 Energy intensive in terms of both physical work and the electricity demanded by his kiln that runs 365 days of the year, Sugiyama is only able to produce about eight pieces a day. 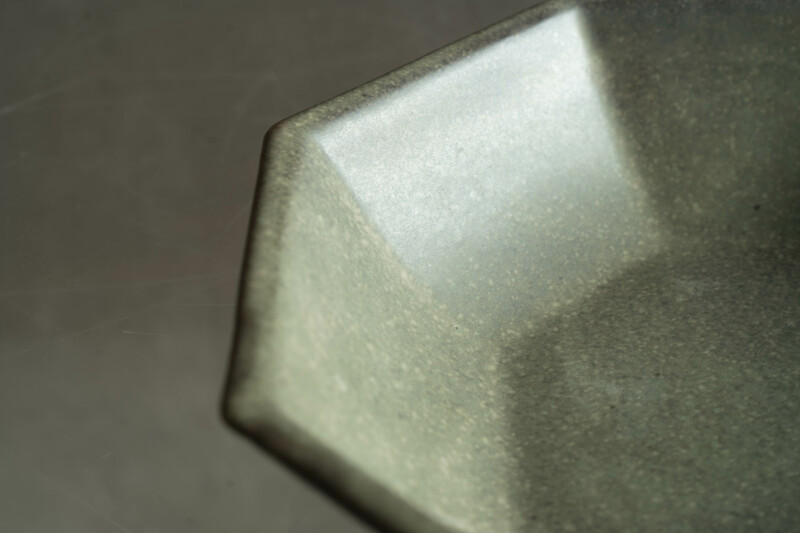 Engraved “Yoji S.” on the underside. 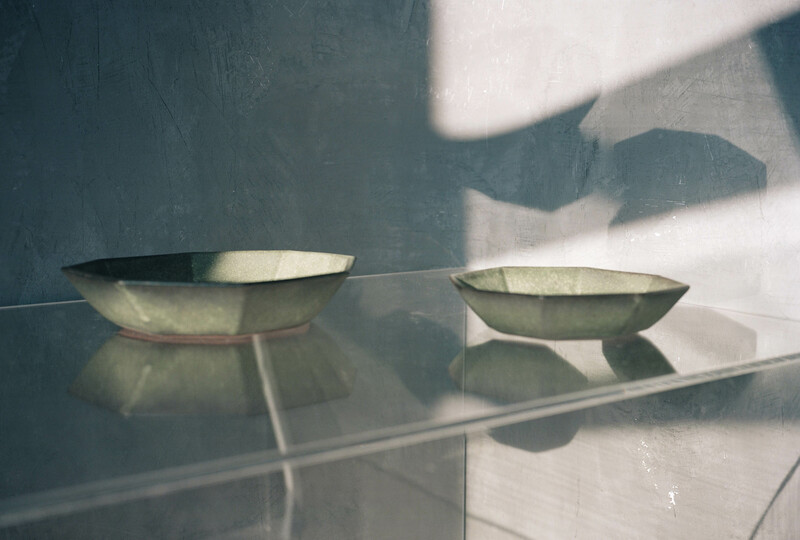 More work from Yoji Sugiyama is currently available. 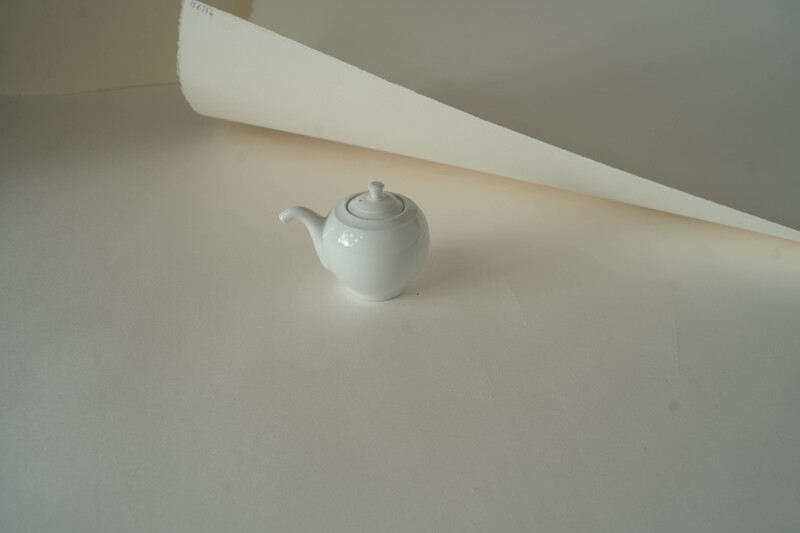 Please email with interest. 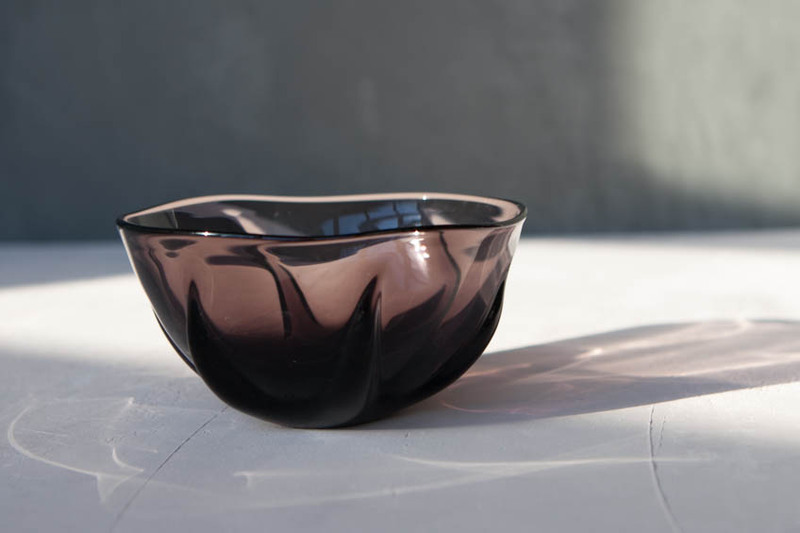 Once he gathers molten glass on the end of one of his steel blow pipes, Yoji Sugiyama has about a half hour with each piece to shape, color, blow, cut, tweeze and transform the mass into one of his otherworldly glass works. 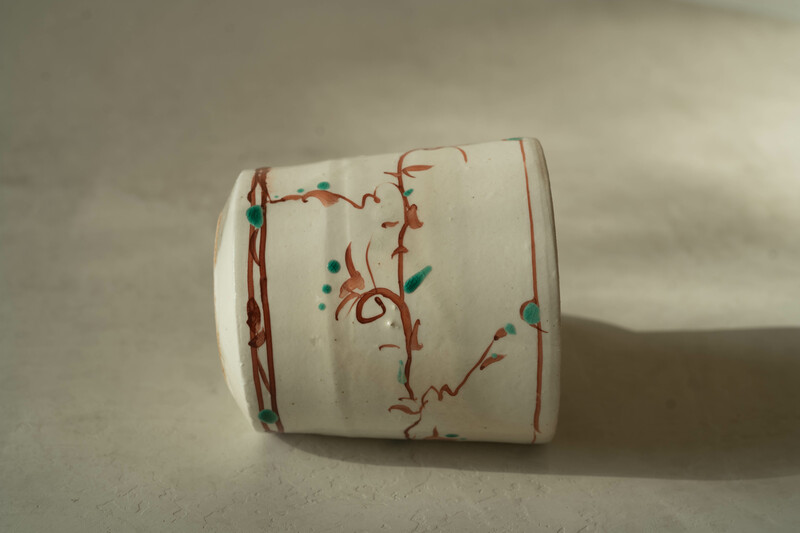 This “guinomi,” or sake drinking vessel, has an undulating rim with six pointed protuberances swirling around its base as if a tentacled sea creature grips from below. 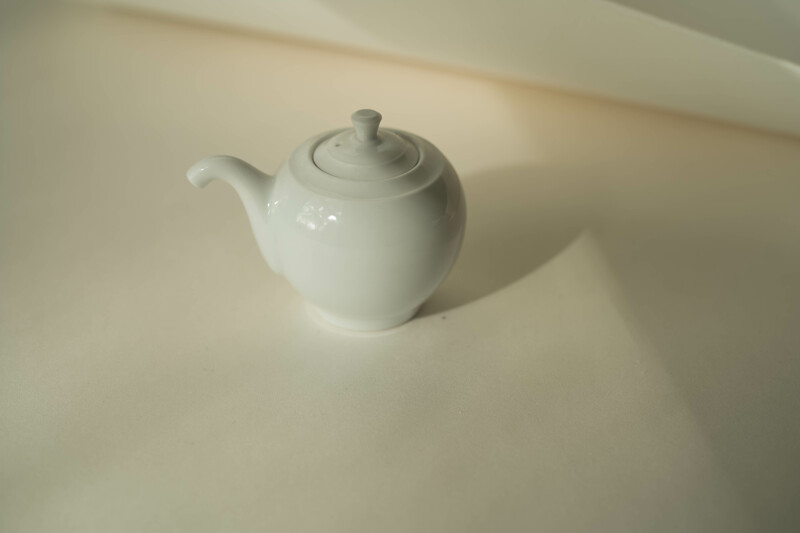 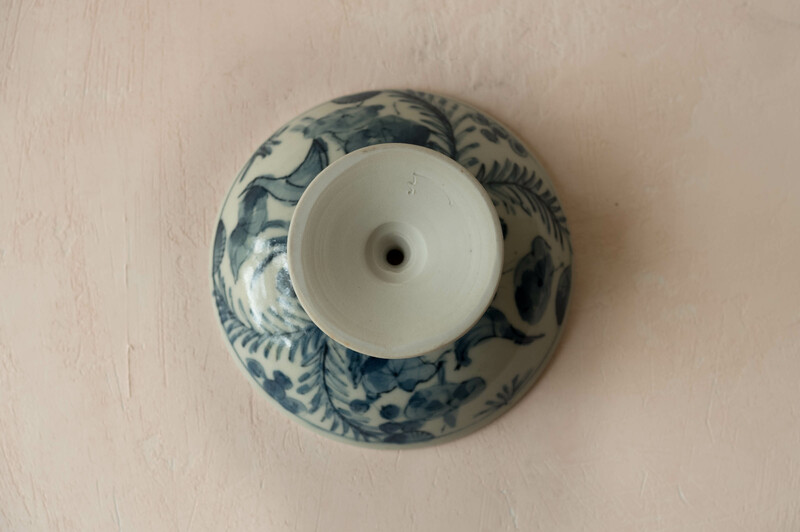 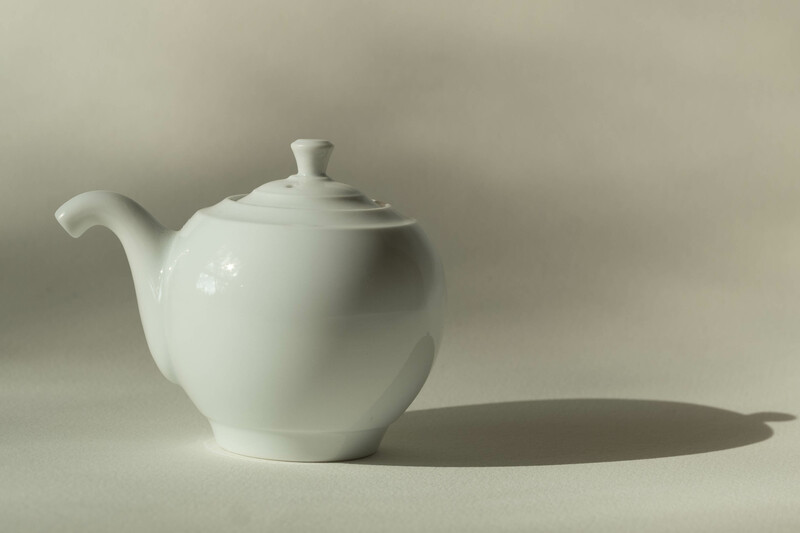 The underside is sanded and engraved with "Yoji S."
This beguiling little pot with its humorous spout is the result of a three year design process led by the extraordinary sensibilities of designer and curator Osamu Saruyama. 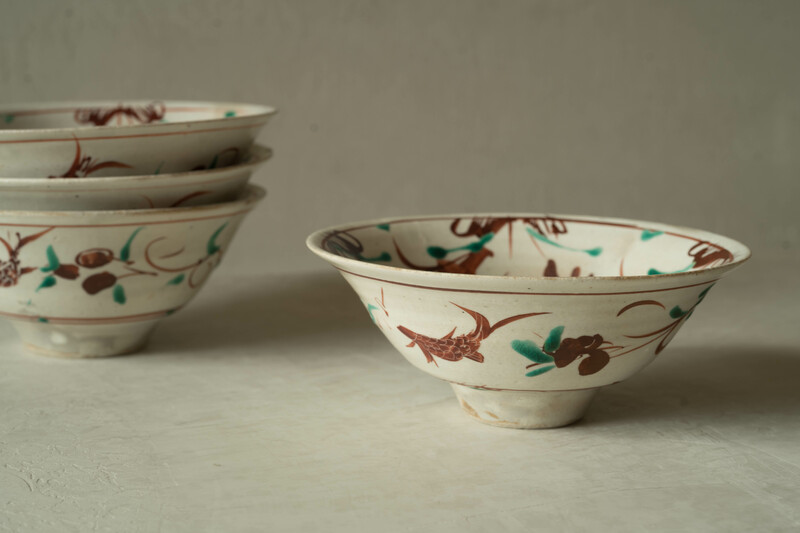 After completing studies in graphic design, Saruyama became well known for his keen eye as an antiques dealer, a passion which took him back and forth between France and Japan for many years. 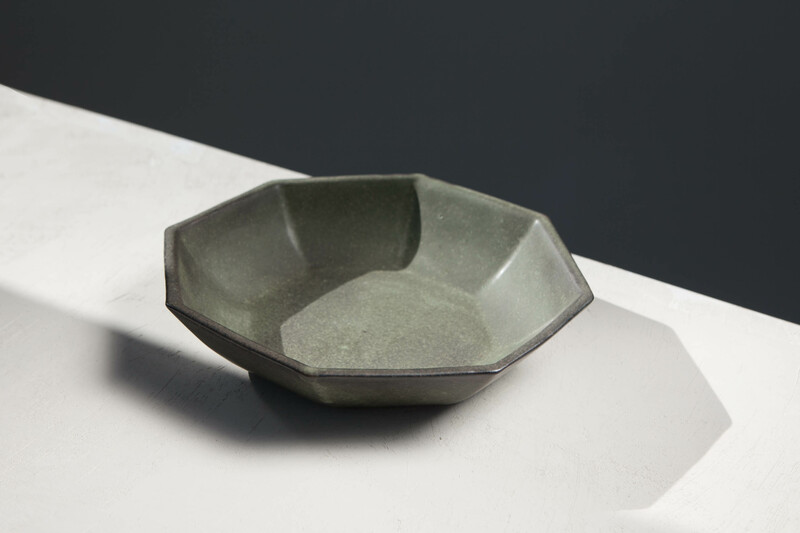 As his reputation as a curator of fine objects grew, Saruyama also began working with highly skilled craftsmen of Japan to design new classics that could hold the same long-term aesthetic value and revered life of the antiques he’d been dealing. 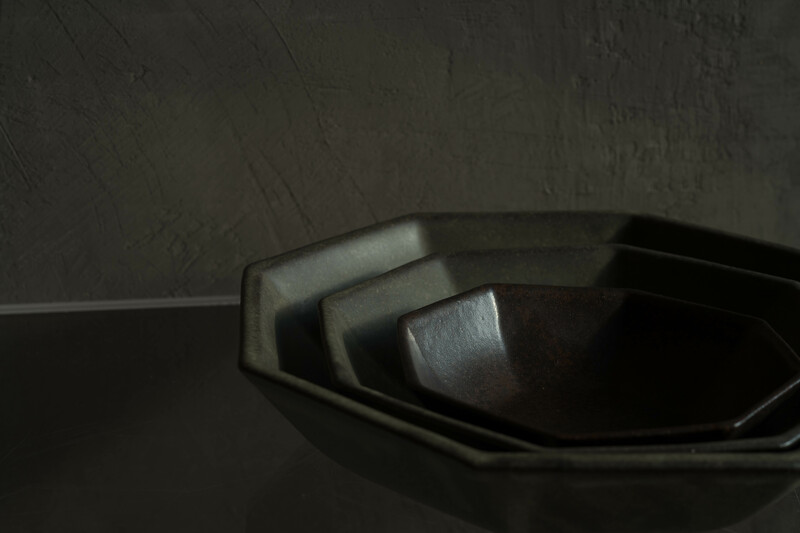 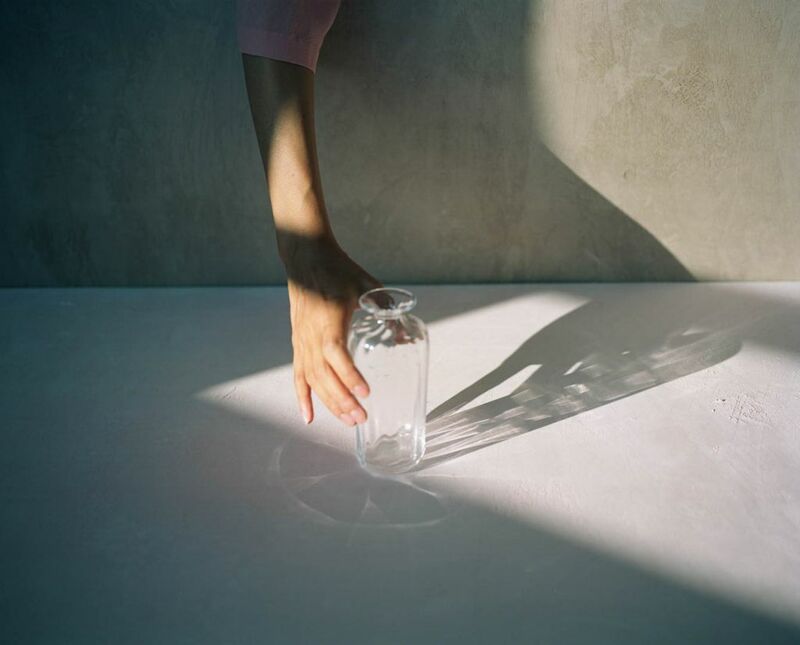 With this pouring pot, Saruyama ceaselessly sought to create a more perfect vessel where not a single drop of its contents would be wasted during its pour. 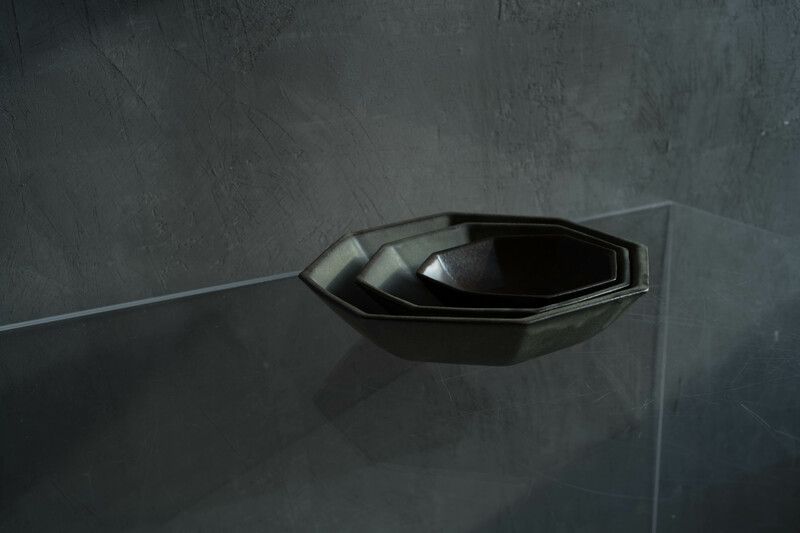 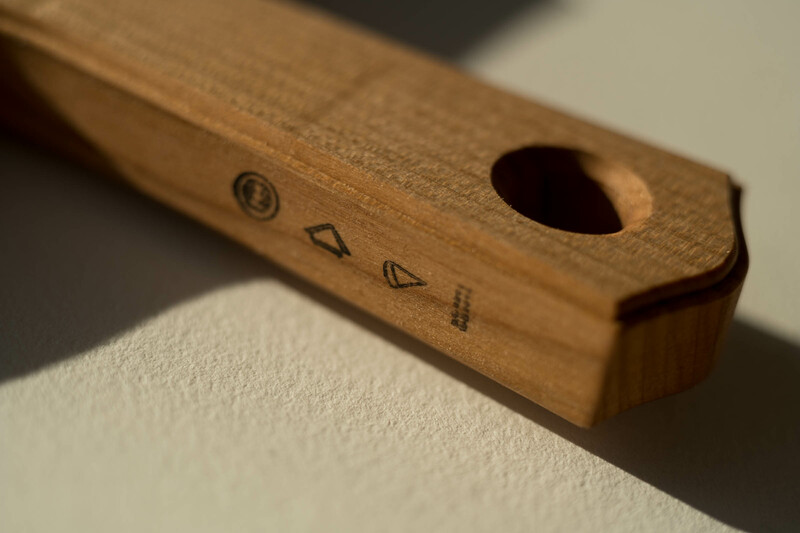 The inside of the pouring spout is designed with grooves such that any remaining liquid retreats back into the main body due to an ingenious vacuum effect. 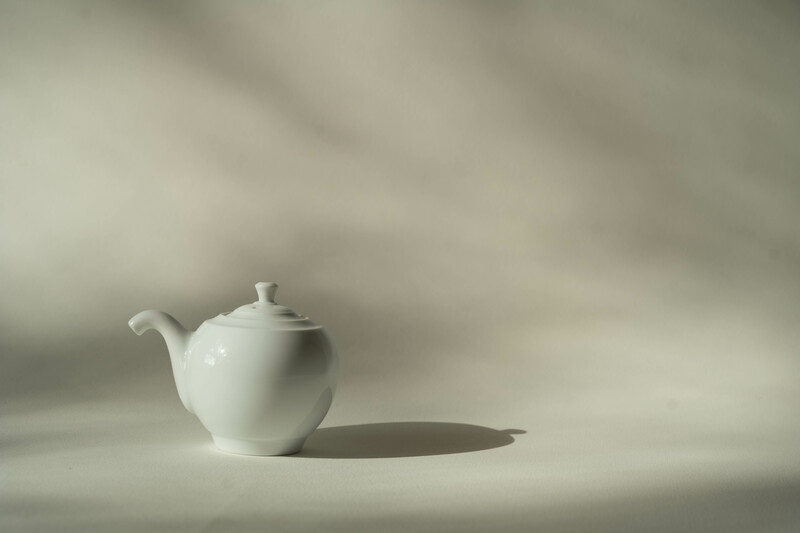 The downward curve of its spout calls for minimal effort on the part of its user, making it friendly in both appearance and use. 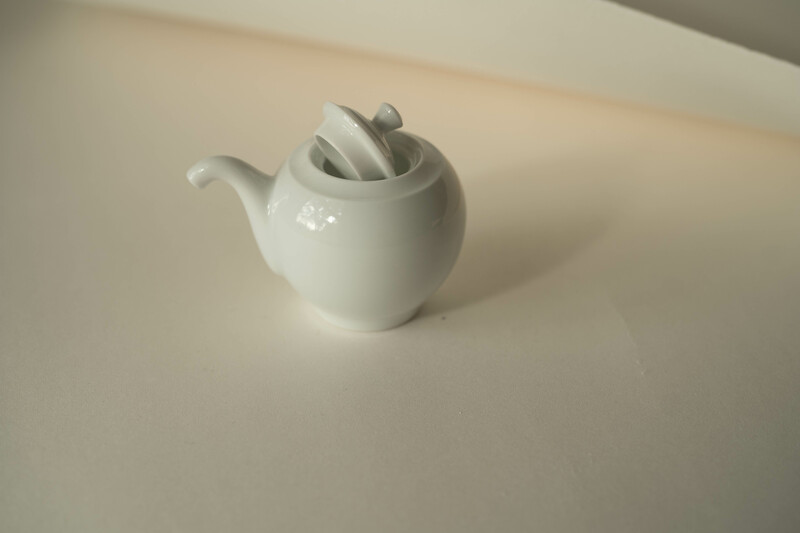 Though named “soy sauce pourer,” it is designed for use with any liquid that will not clog its spout. 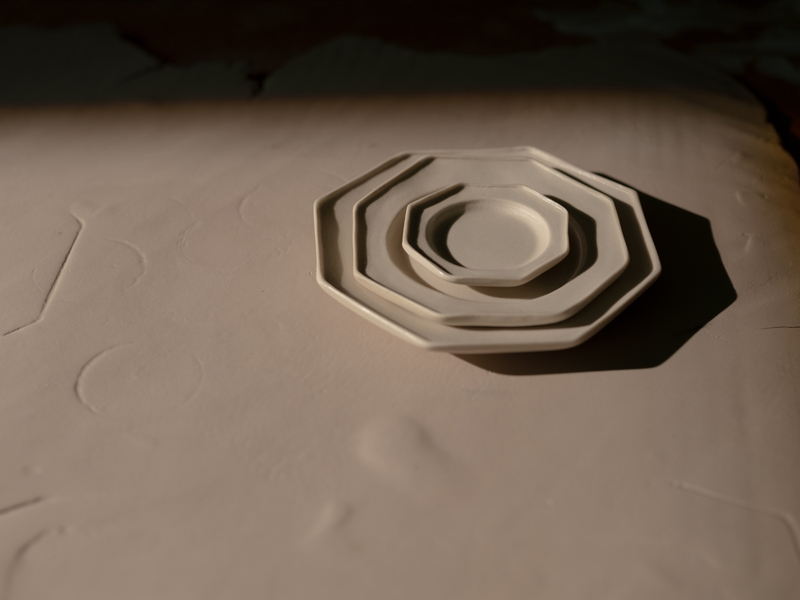 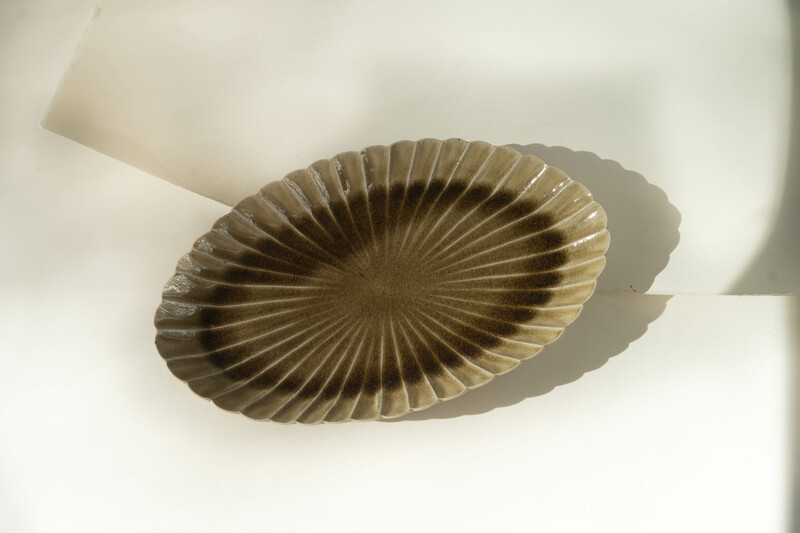 A slightly wider and deeper version of Miyata’s 32-petaled oval dish. 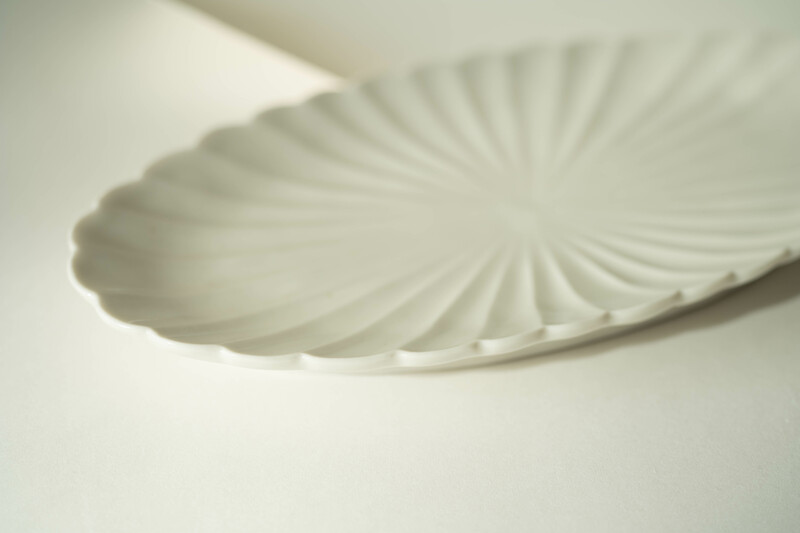 This dish with scalloped edge is oval in shape with 40 petals extending outward from a single point and rising from its inner foot. 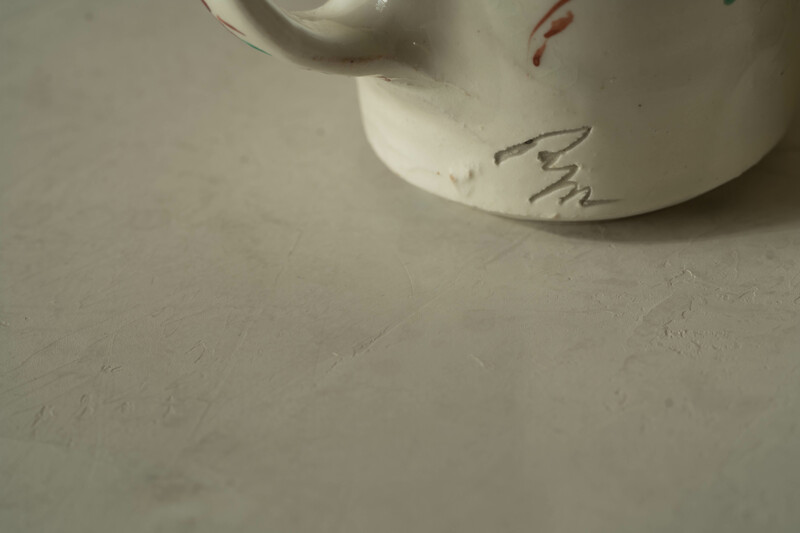 In subtle contrast to its delicate upper body, its outer foot and underbody are left relatively crudely hand carved and marked with “M” carved into the clay body, creating a wonderful balance of refinement and informality. 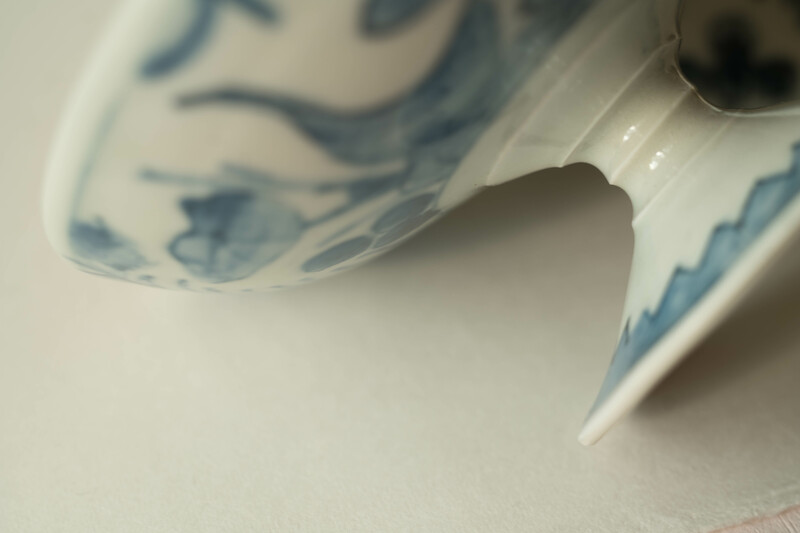 Blooming in the cold September air, the chrysanthemum is a natural symbol of autumn and perseverance across several cultures. 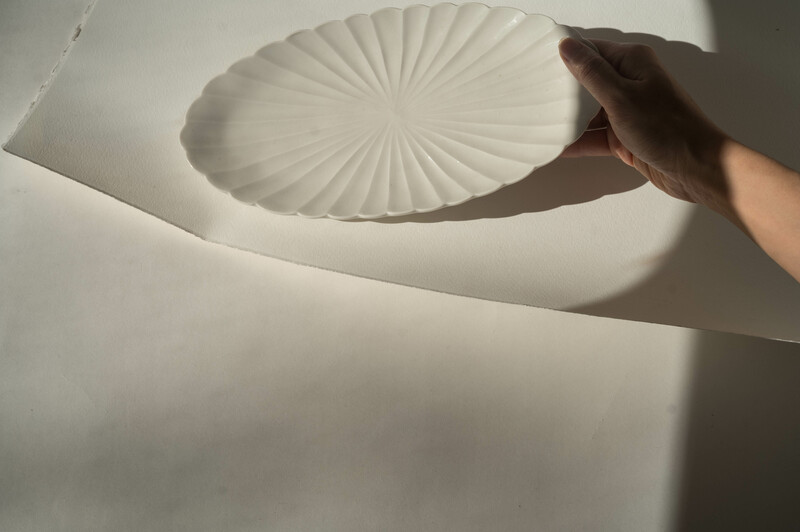 Rejuvenation, intellectual pursuits, loyalty, perfection, and the sun also find meaning in the chrysanthemum. 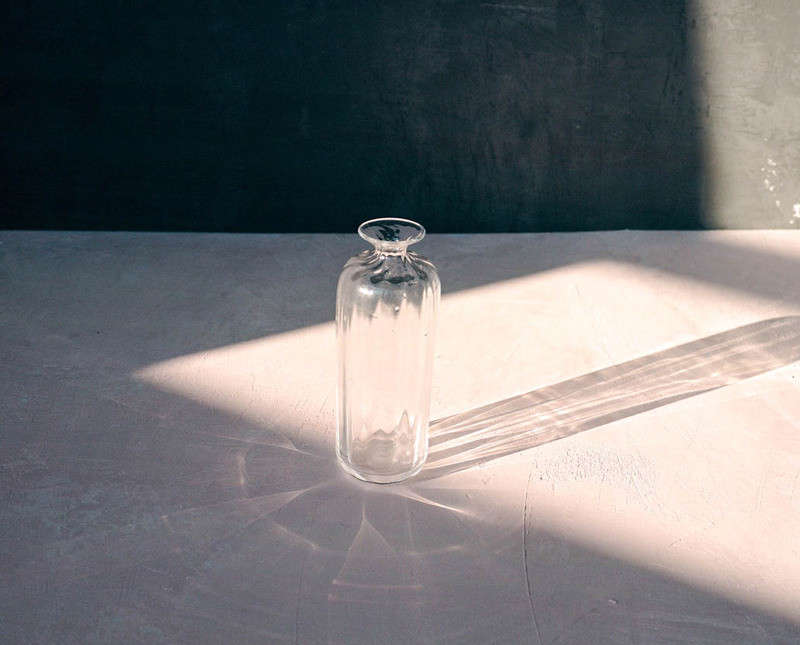 In China, ancient lore tells of a man who became immortal after drinking dew from its petals, while in Japan, the unfolding of the petals symbolizes perfection and the rays of the sun. 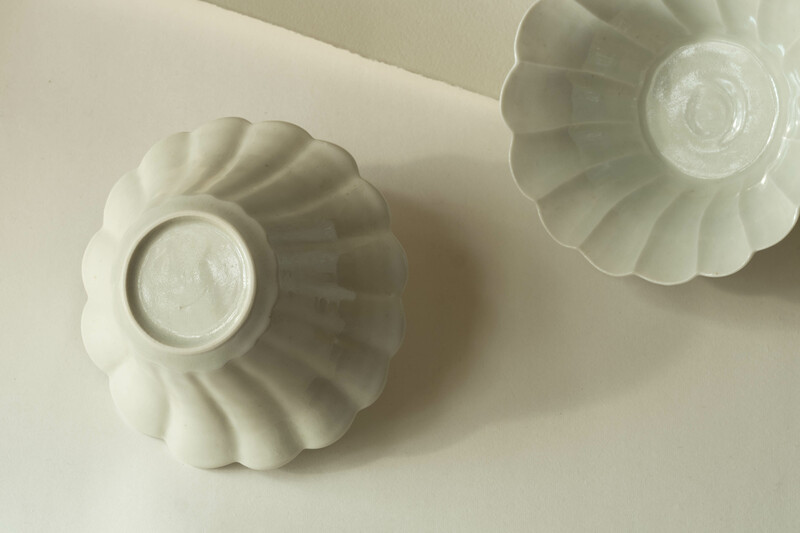 Although eating from Miyata’s dish may not result in immortality, indeed it is a flower and a dish to meditate on. 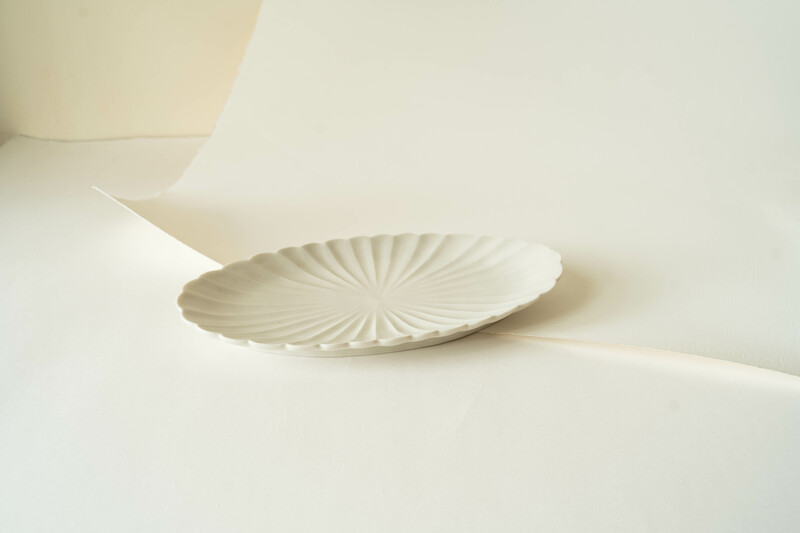 With this dish, Ryuji Miyata looks back to the ceramic history of China and reworks the enduring chrysanthemum form, examples of which can be found as far back as the 10th c. Song dynasty. 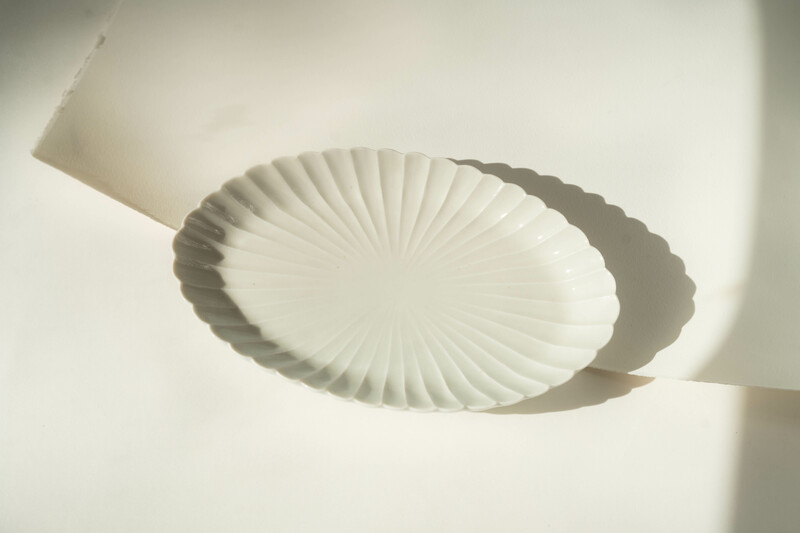 This dish with scalloped edge is oval in shape with 32 petals radiating outward in a gentle rise to its outer rim from a single point on the interior. 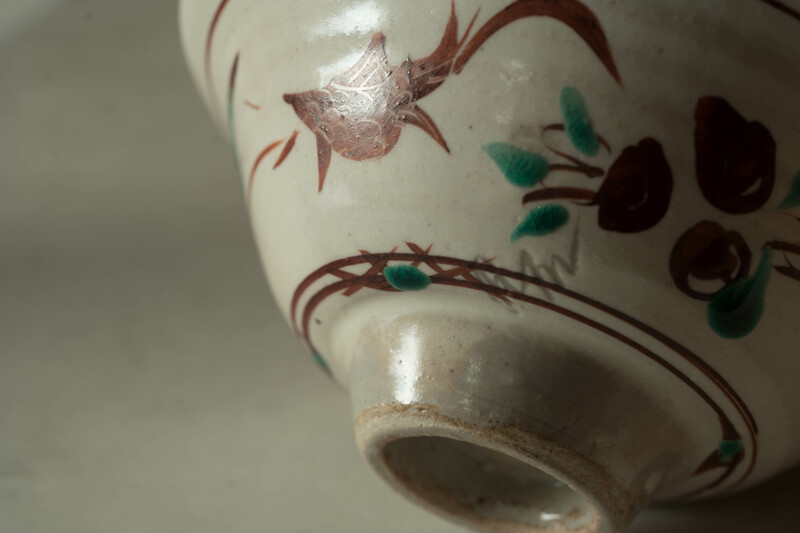 In subtle contrast to its delicate upper body, its outer foot and underbody are left relatively crudely hand carved and marked with an “M” carved into the clay body, creating a wonderful balance of refinement and informality. 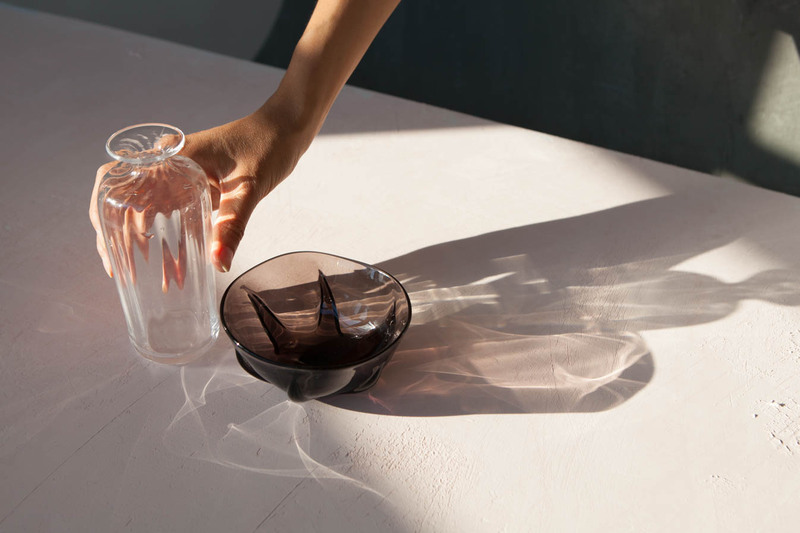 Light appears at once scattered by, stored in, and emanating from within these ethereal forms. 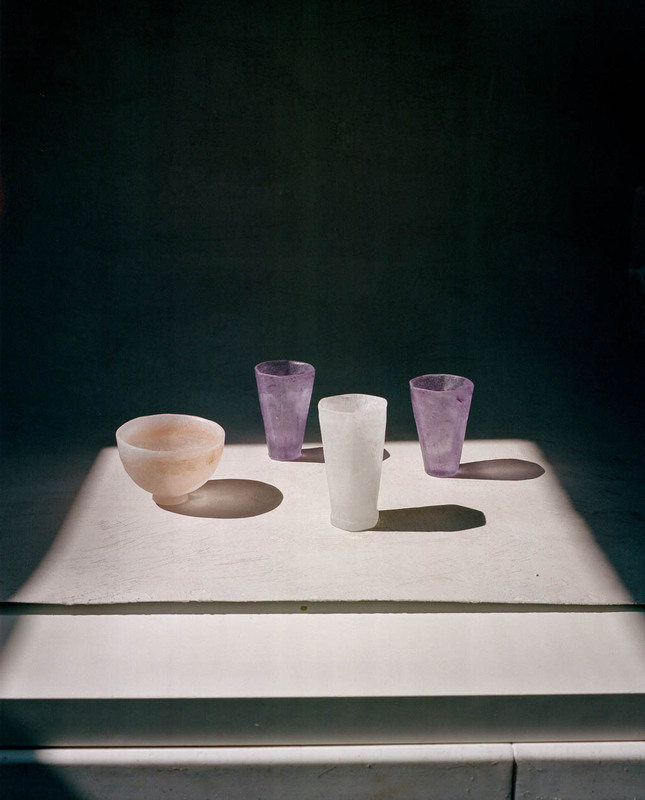 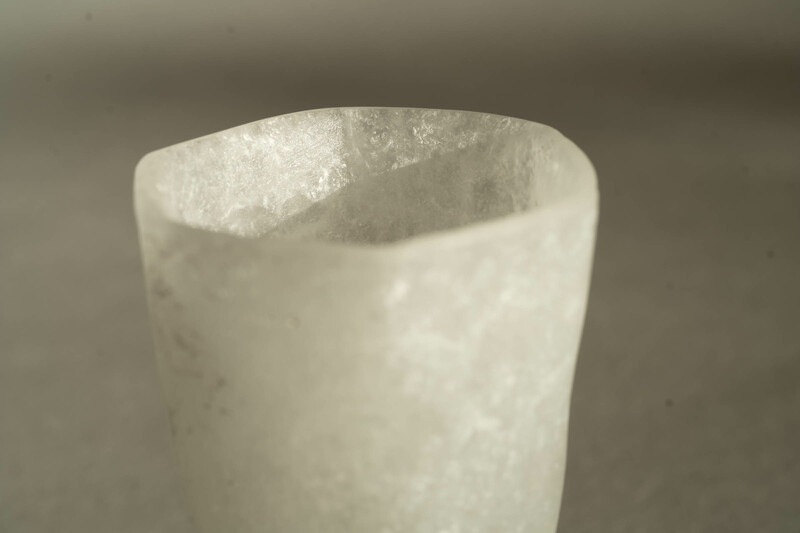 Created using an ancient form of glassmaking called "pâte de verre" ("paste of glass"), each piece requires its own mold that must be cracked open after firing to release the fused glass within. 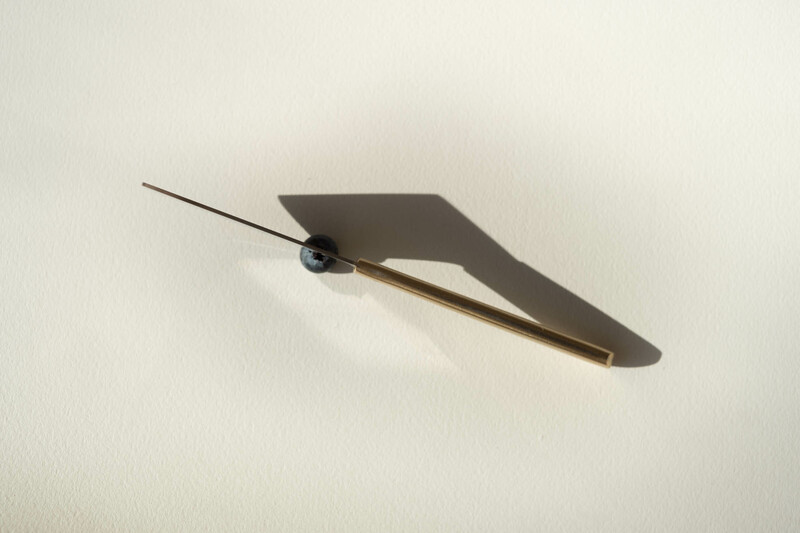 More work is anticipated to arrive in late spring. 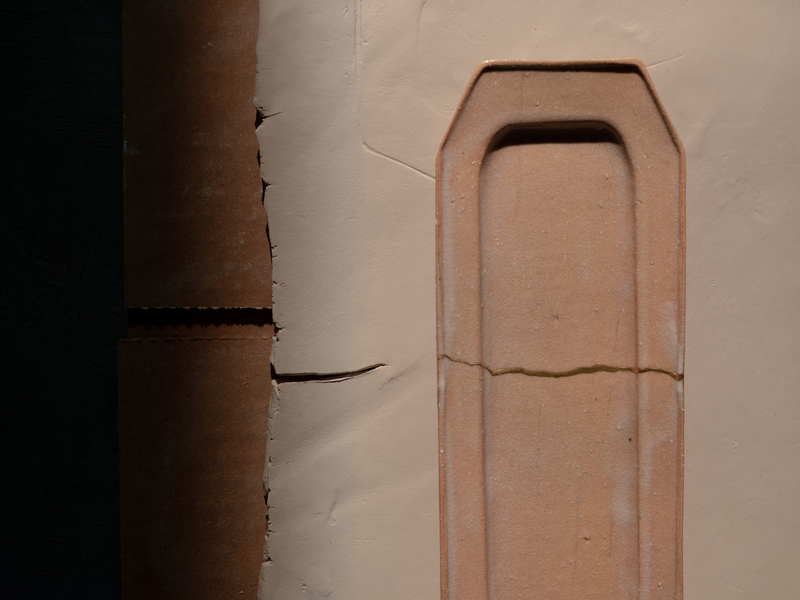 Please check back or email with interest. 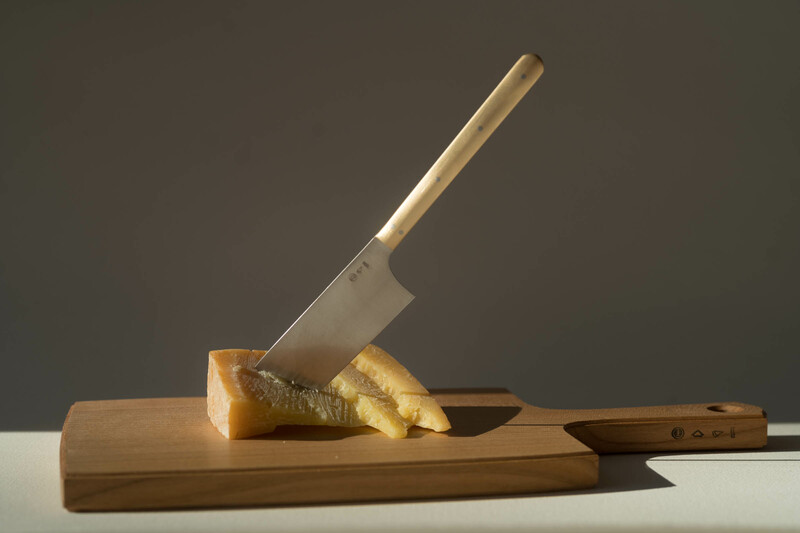 Forged in the foremost knife-town of Seki, in Gifu Prefecture, this cheese knife with its straight spine and ever-so-slightly curved blade pushes toward perfection in craftsmanship, utility, and beauty. 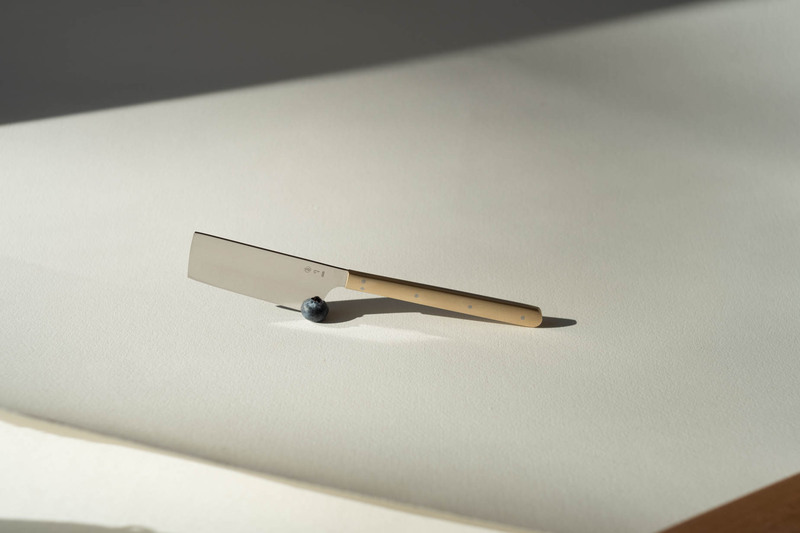 Designed for a long life by Osamu Saruyama, its high quality steel blade can be sharpened to maintain its edge, while the handle, formed in brass and connected by rivets to the steel blade, has a soft sheen that will change patina over time. 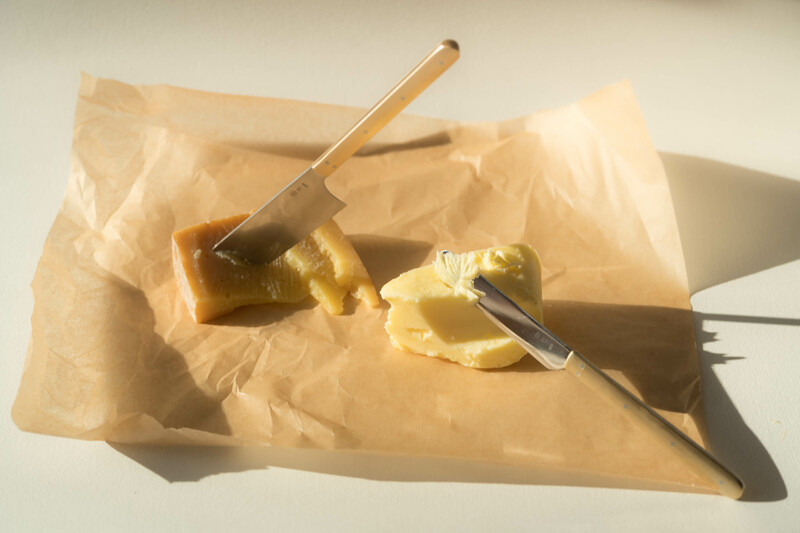 *Use is not limited to cheese. 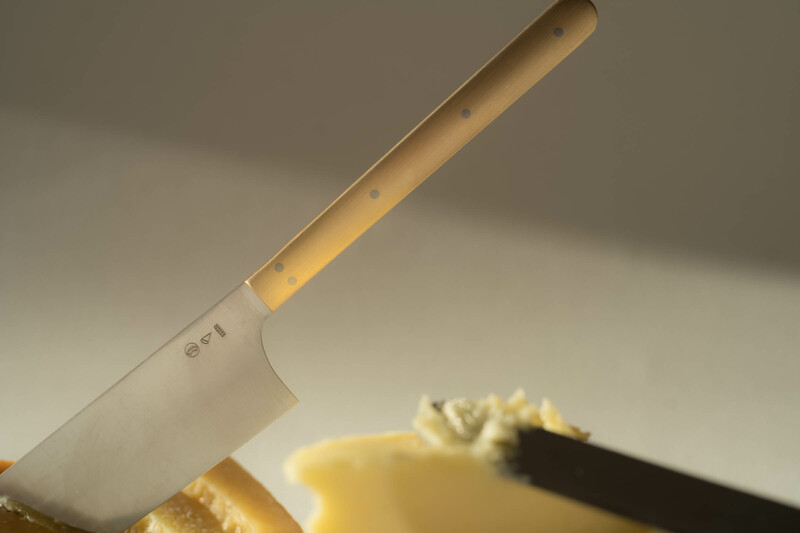 The high quality of the blade lends itself to the same uses as a small utility or paring knife. 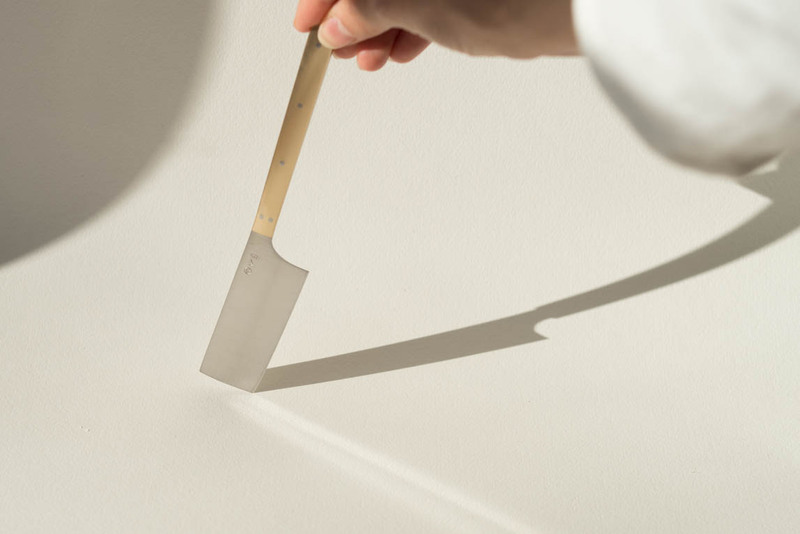 Between 1609 and 1611, seven “imoji” (metalworkers) stationed in Toyama Prefecture, birthed a tradition of fine metalsmithing in Takaoka City, where this butter knife is produced. 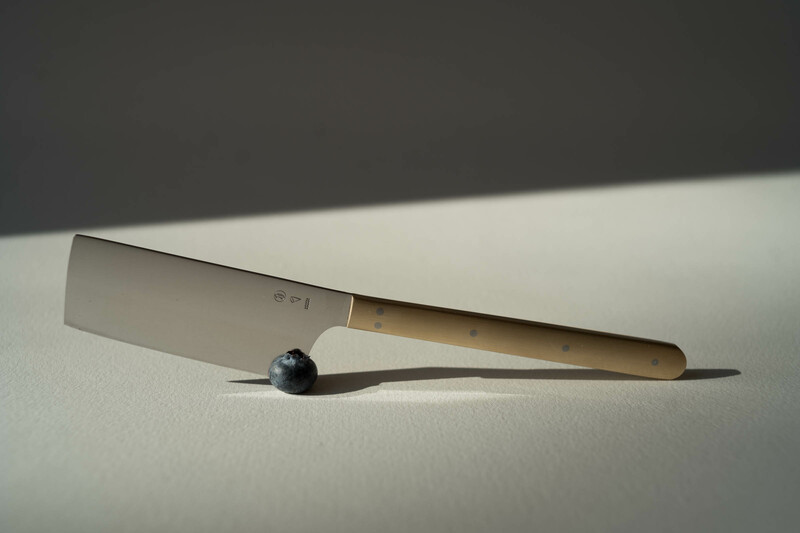 The stainless steel blade is connected with rivets to its brass handle that will gain a patina over time. 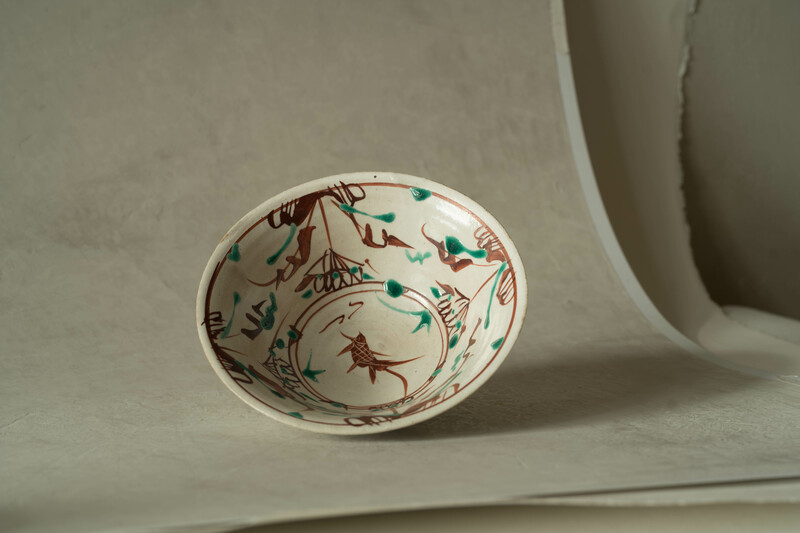 The Yamakura, or wild hill cherry tree, was brought to Japan in the sixth century by Buddhist missionaries to adorn their shrines. 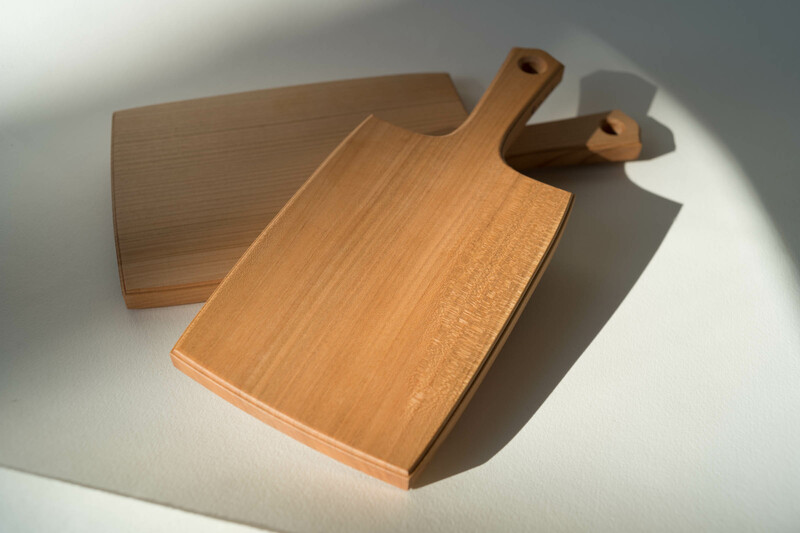 Well-desired for its strength, its fine grain, and its hardness that makes it resistant to warpage, the wood of the Yamakura is a prized material among makers of furniture, cabinetry, and musical instruments. 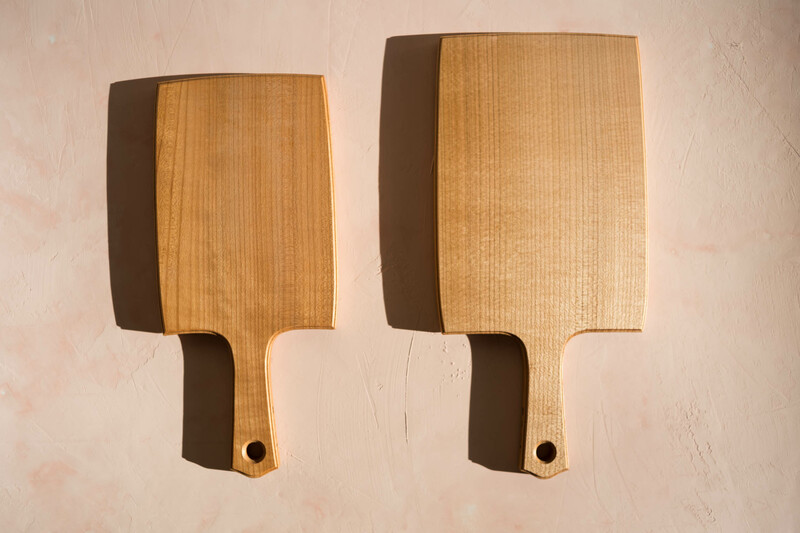 Designer Osamu Saruyama has meticulously designed this cheeseboard with the same attention a luthier would give a prized cello. 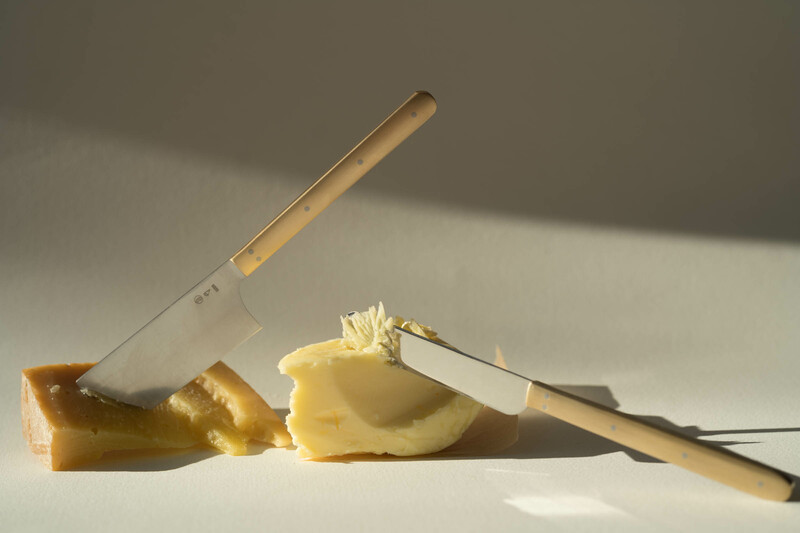 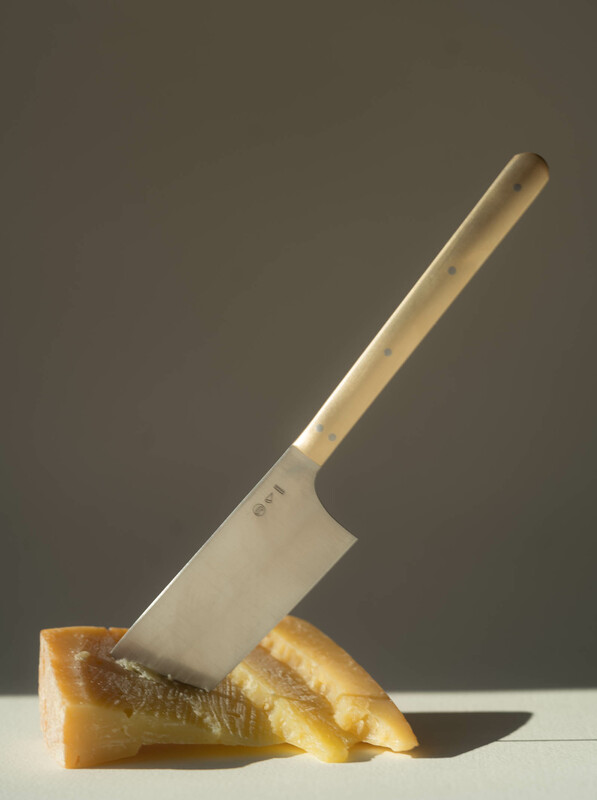 Three sides bow outward with the same curve as the blade of the cheese knife, while the fourth side with handle cinches in for comfortable gripping. 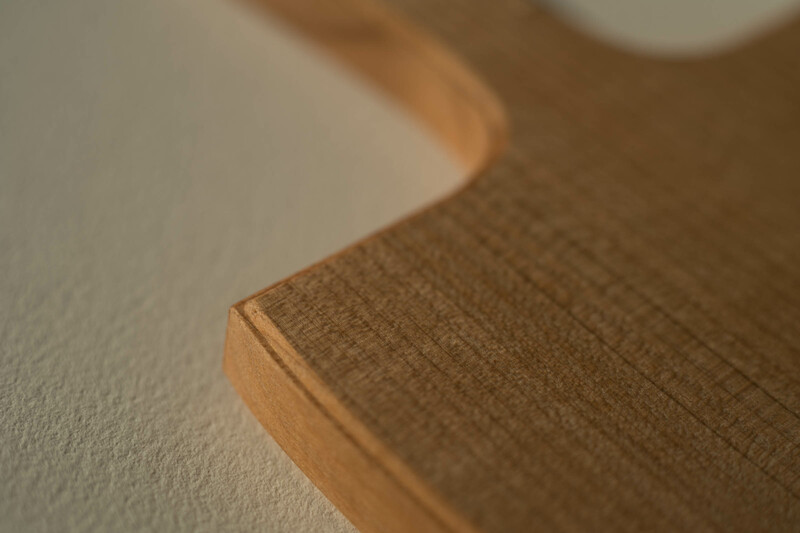 The elegant lines of the board are highlighted by the precise chamfering of its edges, with an offset two-tiered profile. 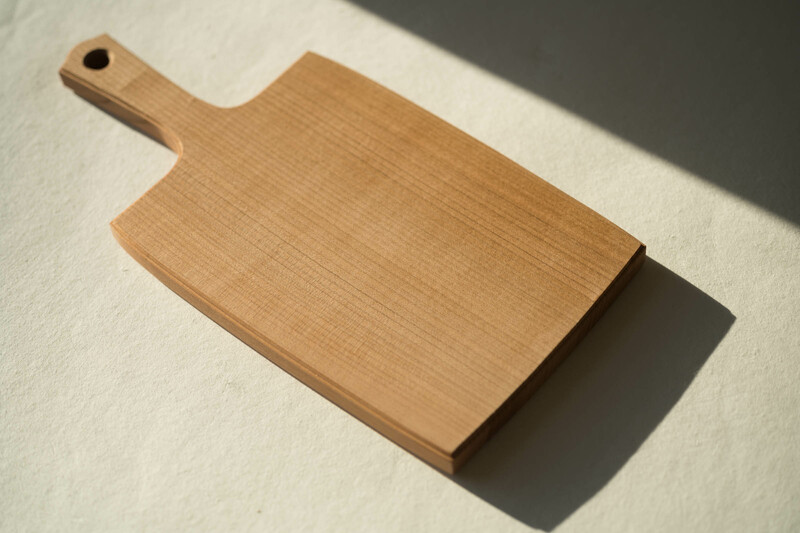 Produced by Azmaya with wood from Gifu and finished with walnut oil from Nagano, it is marked with Azmaya's logo on the handle. 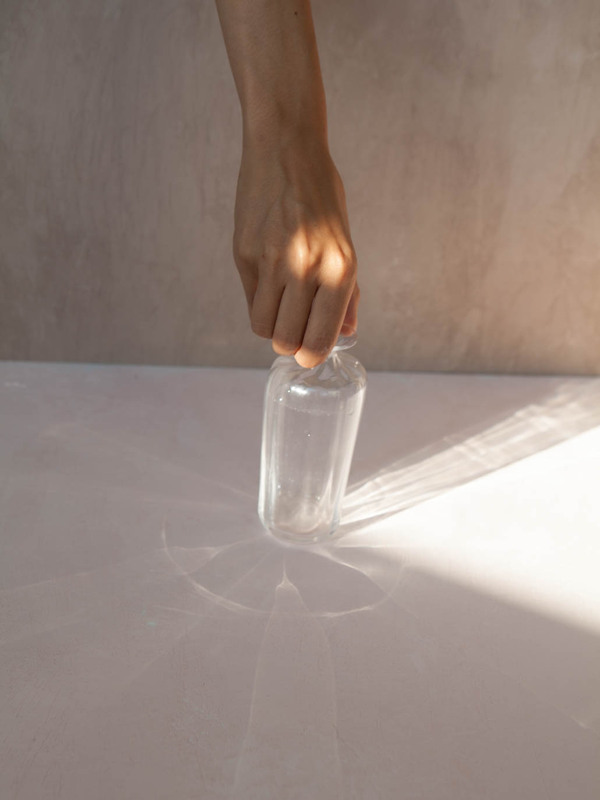 Care: Hand wash only and dry thoroughly after each use. 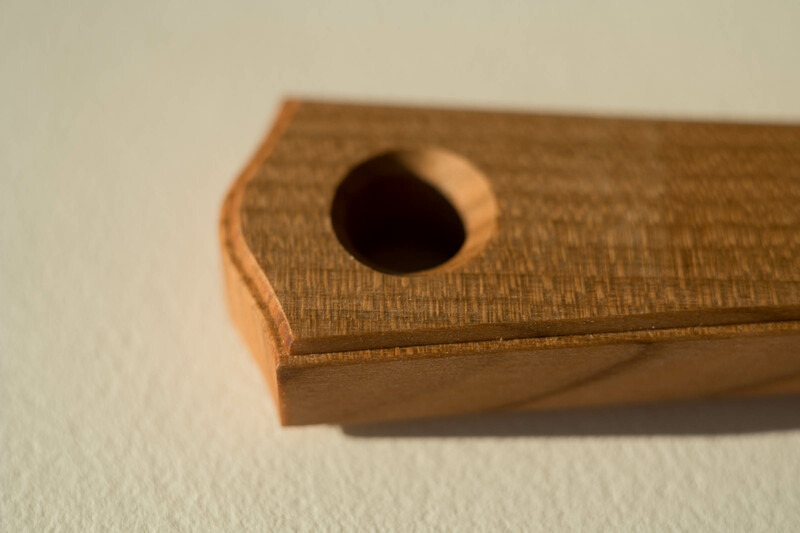 Apply oil or wax as needed to a completely dry board. 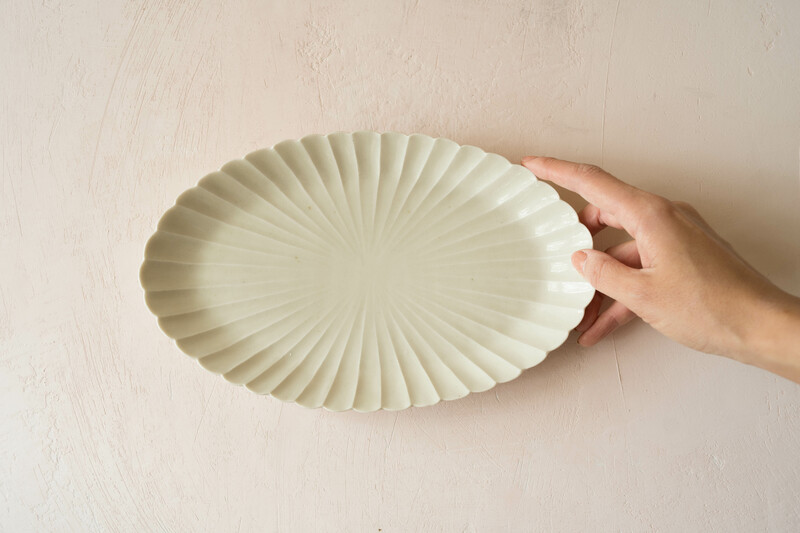 Full of grace in its welcoming shape, Ryuji Miyata's small round chrysanthemum dish with everted rim evokes the gentle unfurling of a flower in bloom. 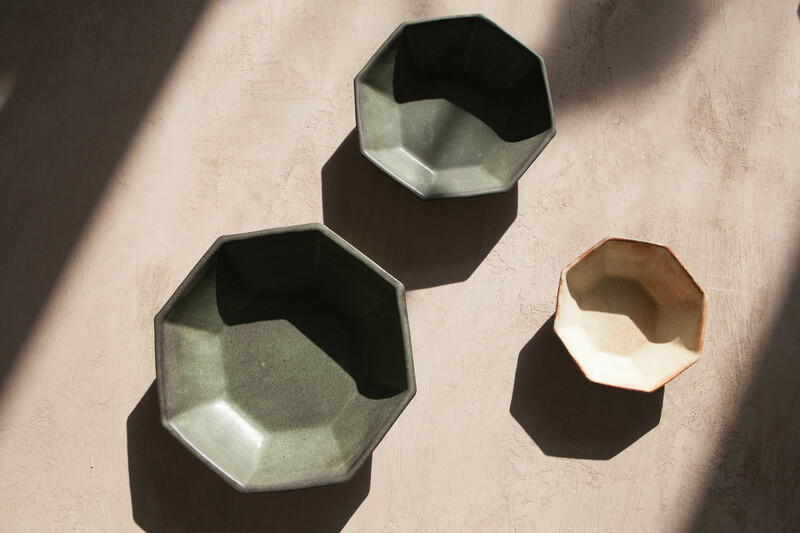 All pieces are made by Miyata himself at his studio in the pottery town of Mashiko. 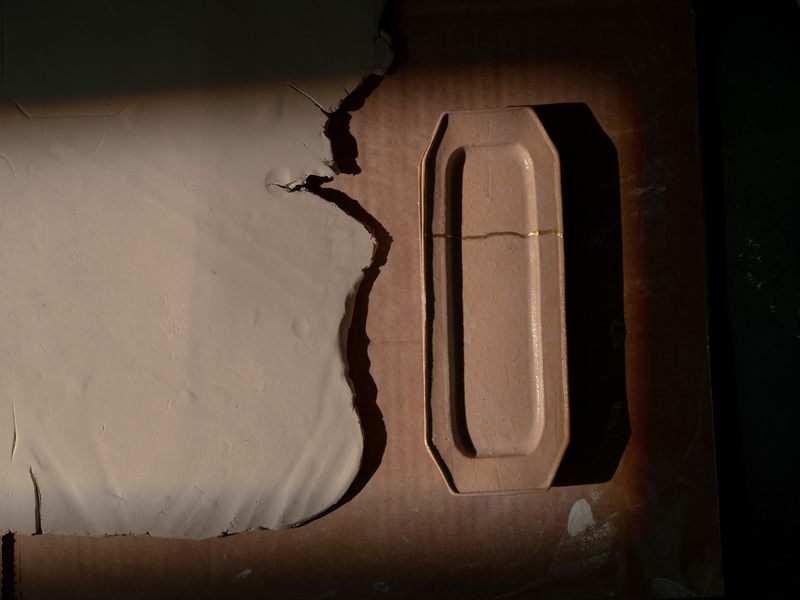 Variations: deep brown glaze. 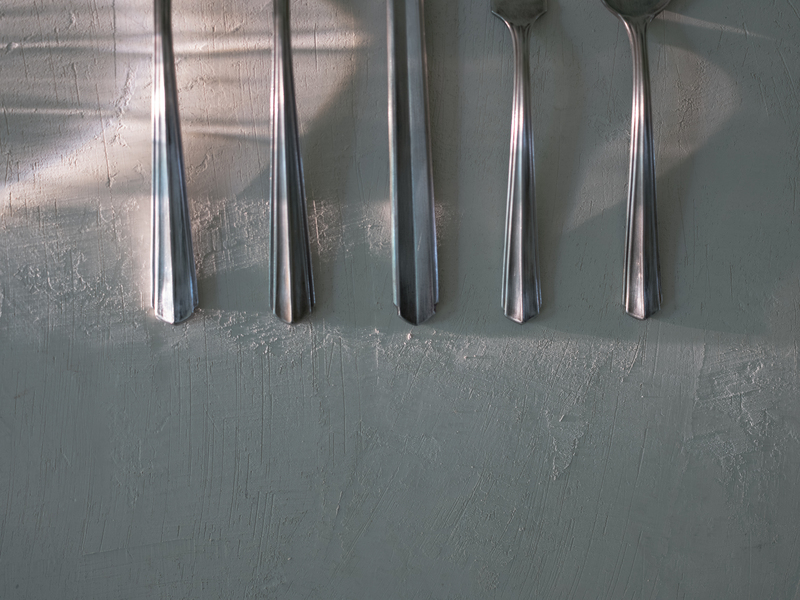 please email to enquire. 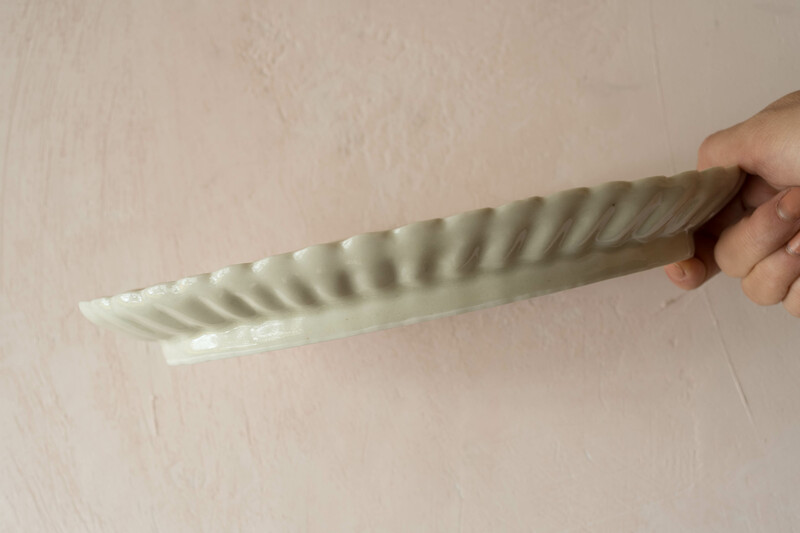 This footed dish has a rounded bowl atop a grooved and hollowed foot. 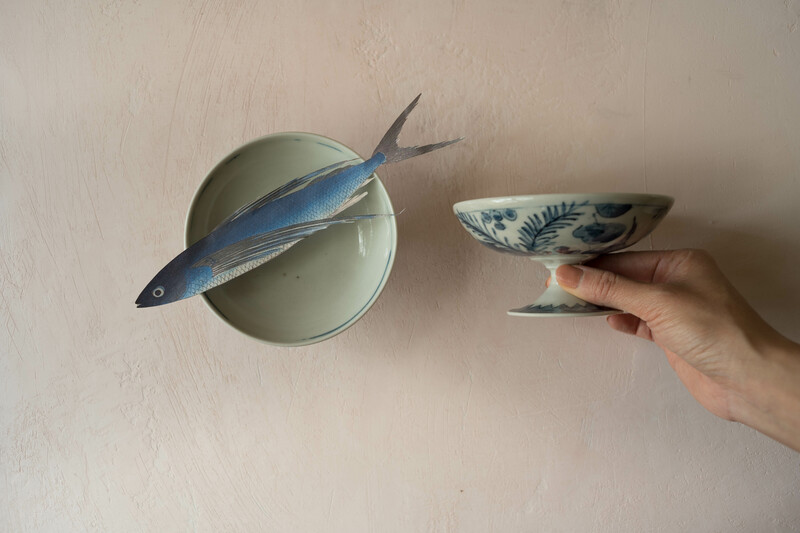 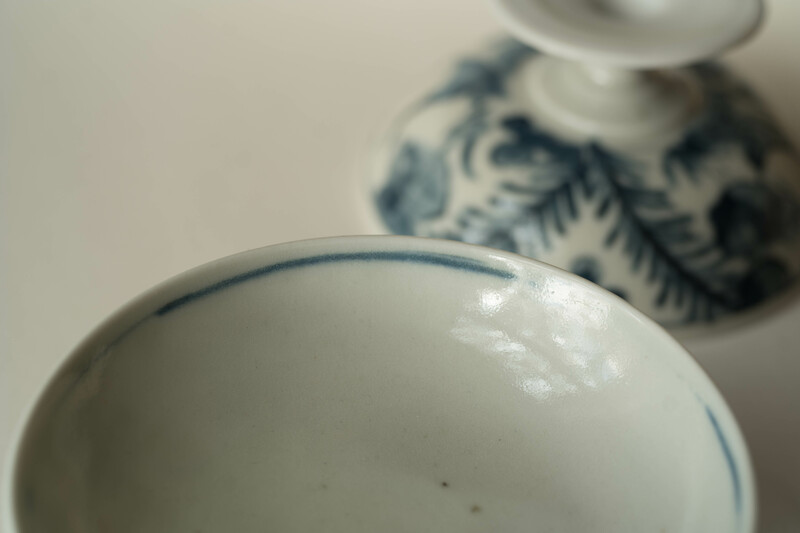 Cross-referencing Chinese blue and white stemmed cups from the 13th century and sherbet dishes of a more recent western past, Miyata creates a delightful dish whose loose and playful drawing style in cobalt underglaze sets a wonderful tone of ease and romance. 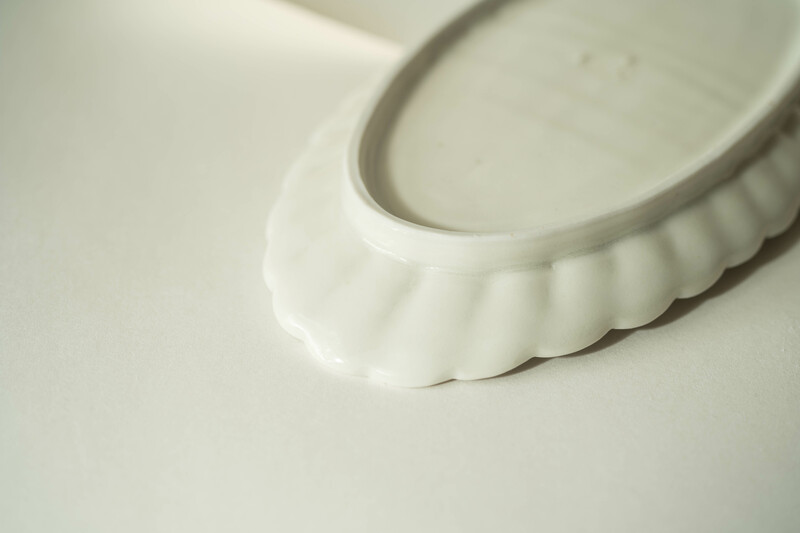 A zig-zag pattern encircles the base of the foot while moving upward, the finely turned and tooled stem is left unadorned. 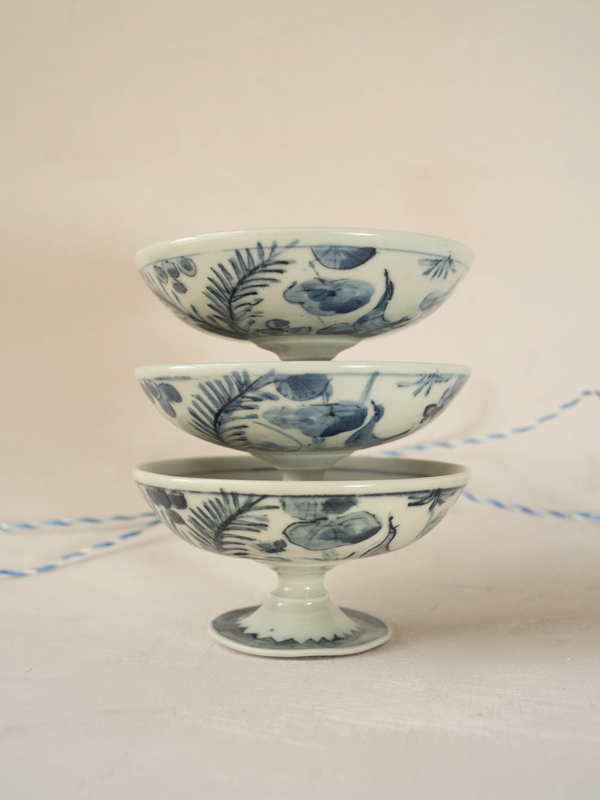 Two sets of ferns on either side of the main body swoop up and outward, creating a protective covering under which a bird curiously inspects a group of placid water lilies. 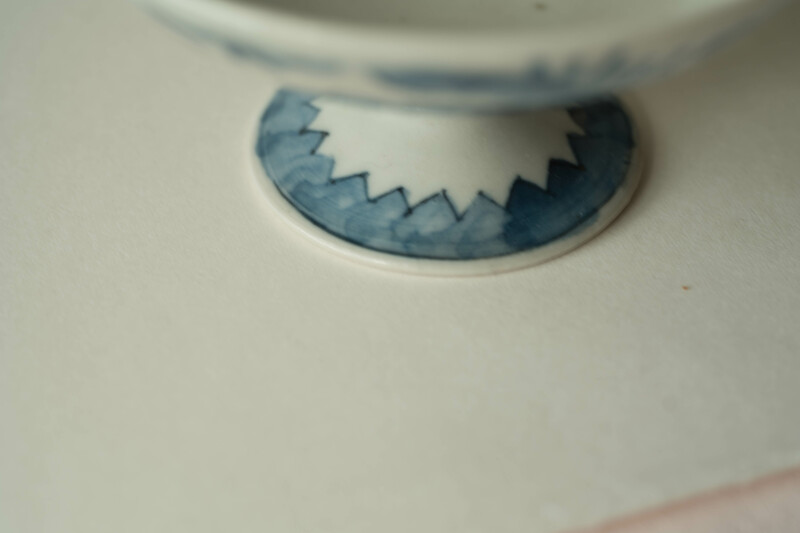 A thin wavering line along the inner rim completes the motif. 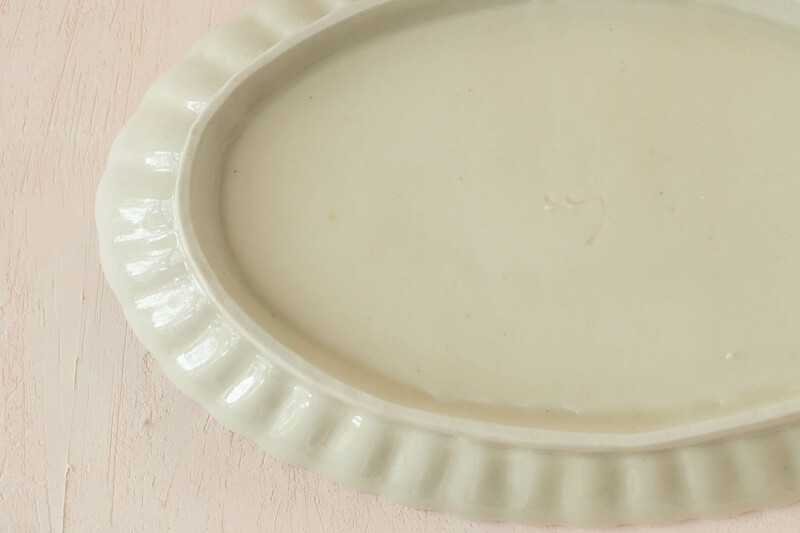 *Fill with berries and cream, chocolate mousse, ice cream with syrup, or use as a candy dish for wrapped caramels, pate de fruit, jellybeans, or after-dinner mints. 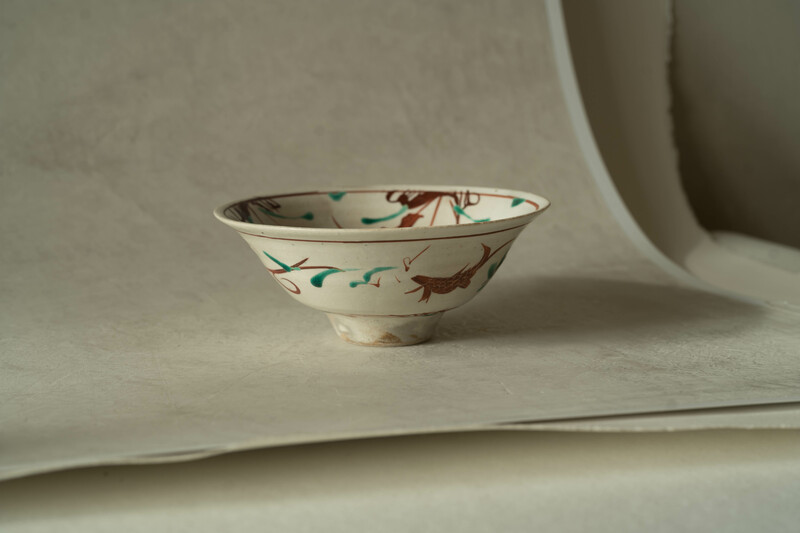 A red goldfish sits in the base of this inviting rice bowl, surrounded by long stemmed flowers turned upside down as if reflections in water. 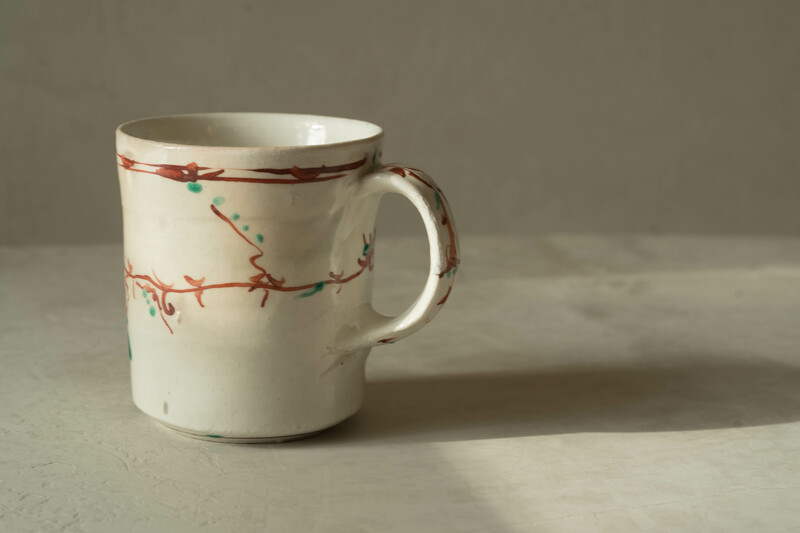 Deft strokes of crimson and emerald glaze create energetic stems and leaves over speckled clay with off-white glaze imparted with grey and peach hues from firing. 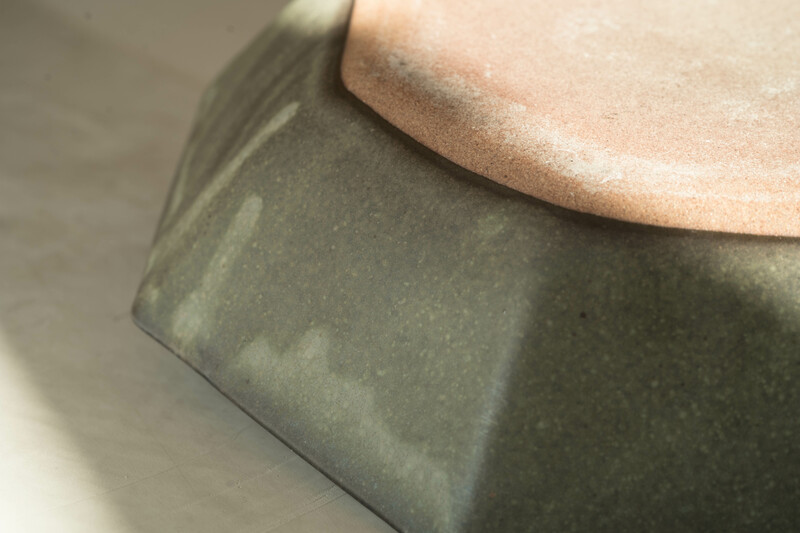 Miyata’s mark, “RM” is carved into the clay body near the outer foot. 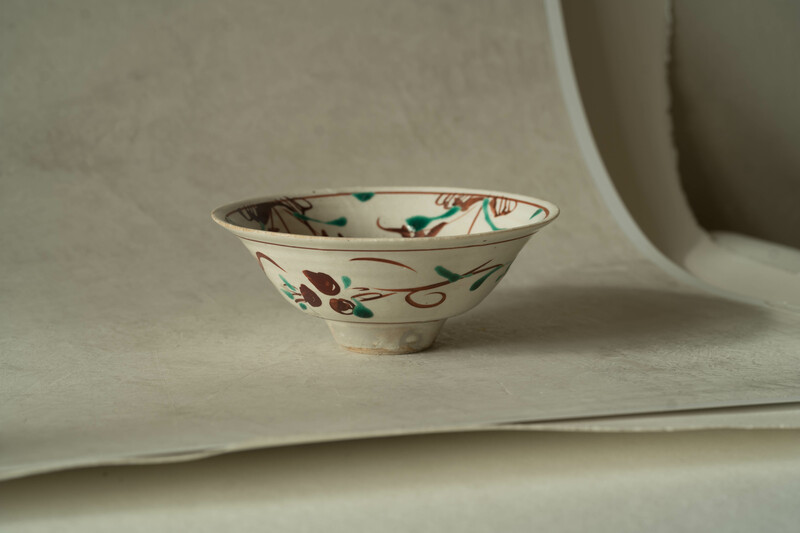 Off-white speckled clay from Mashiko, hand-painted with green and red overglaze, with peach and grey tones from firing. 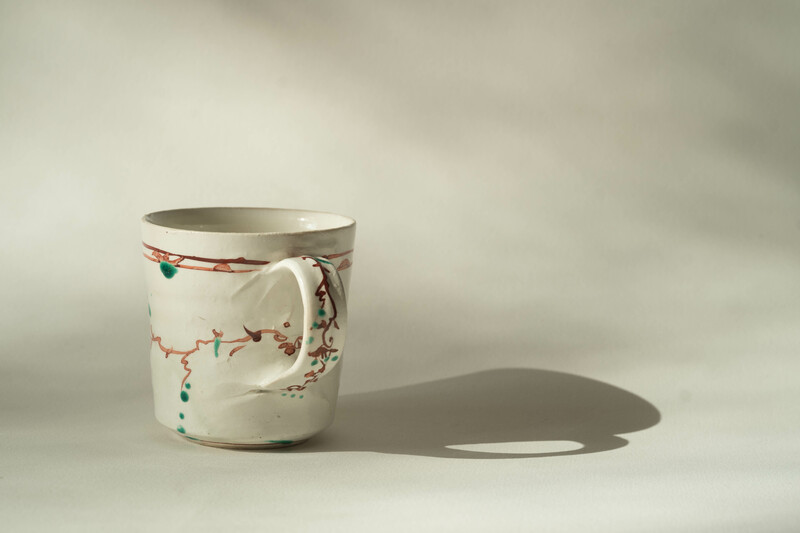 Vines in ruddy red and emerald green run down the pulled handle and along the midline of this mug by Ryuji Miyata. 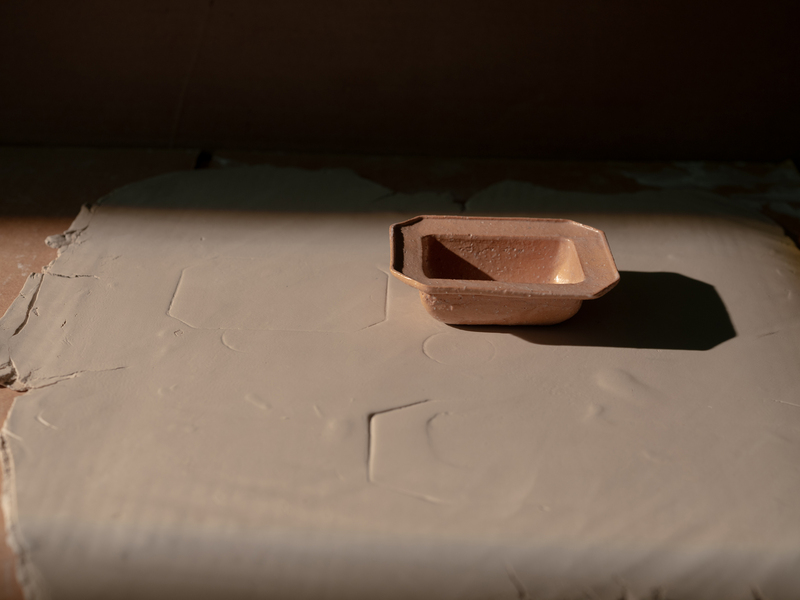 Miyata lets the mark of his hand live freely in these pieces, making apparent the materiality of the clay in the simply attached handle and slight grooves in the main body. 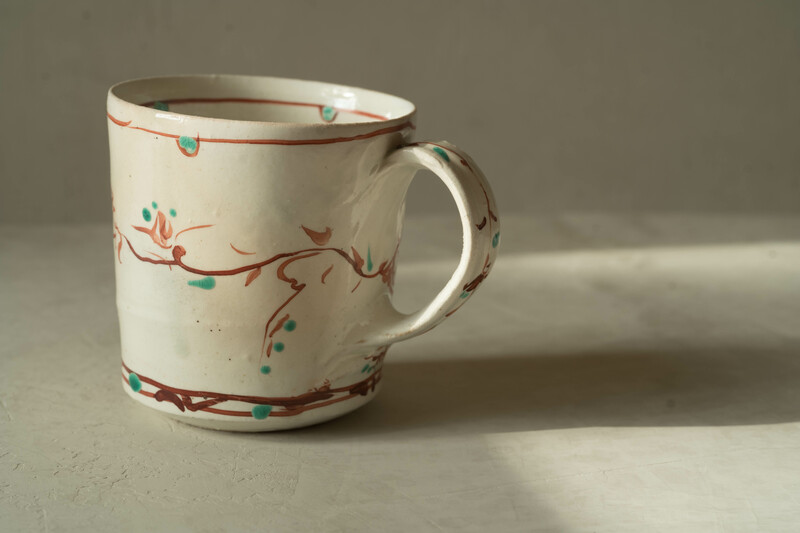 A double line motif runs along the top of the small mug, and the bottom of the large size. 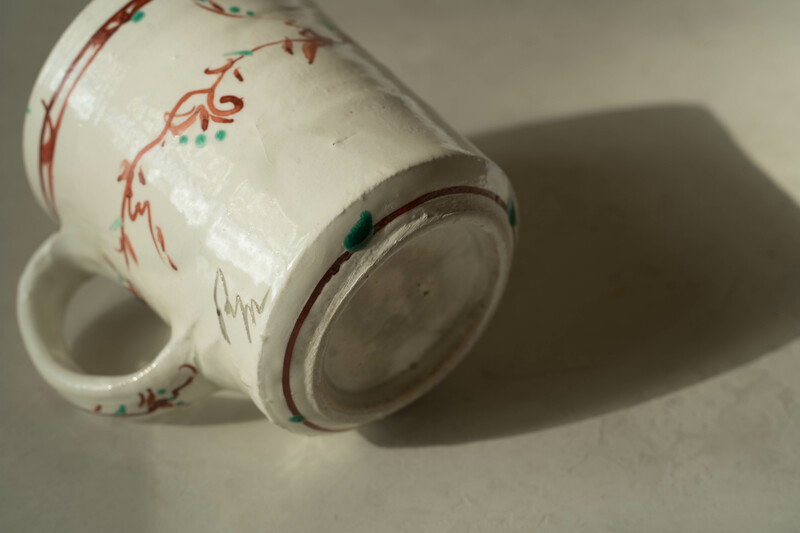 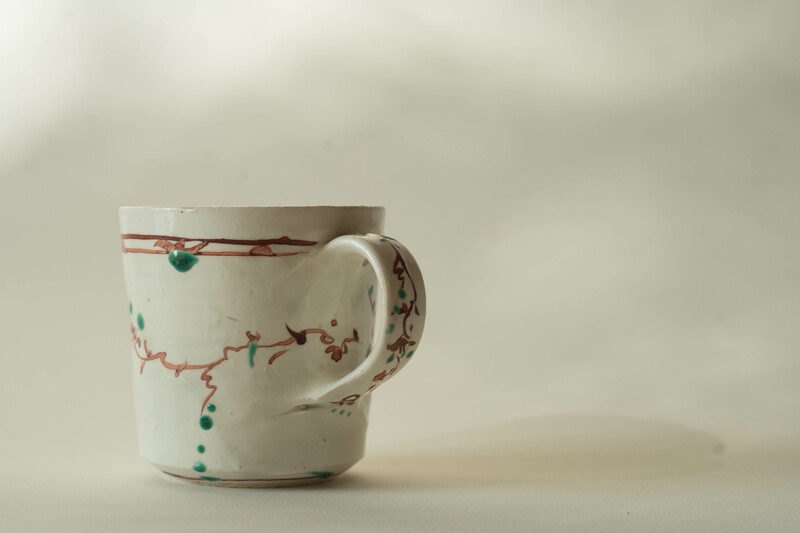 A single line with half-dots runs along the top of the large mug, on both the interior and exterior, while the same motif is painted on the underside of the small size. 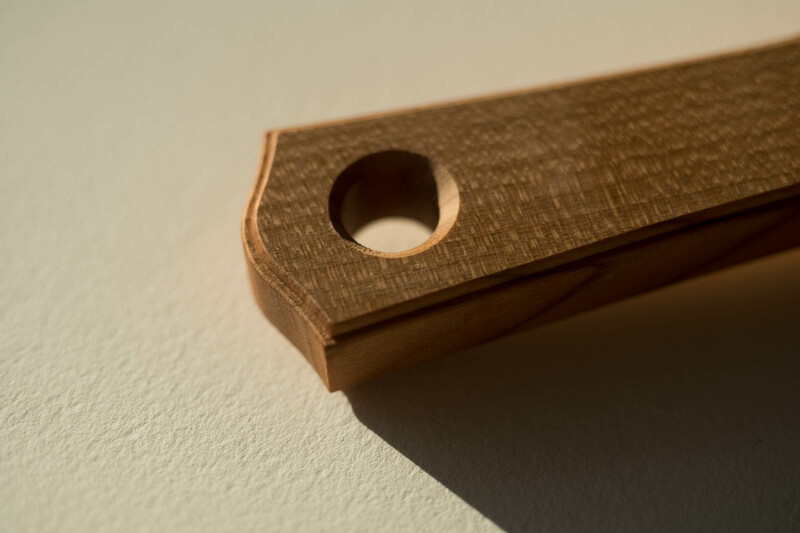 Both sizes are marked with “RM,” offset near the base of the handle.